Living in Louisville, we are so fortunate to be able to experience the beauty of all four seasons. Fall has always been my favorite season. The colorful fall leaves on the ground and the smell of the crisp air makes being outdoors during this time of year so pleasant. Luckily, Louisville always offers great fall activities that allow us to enjoy the beauty of Louisville during autumn. If you are looking for fun outings for the rest of the month, you are in luck! I have compiled a list of all of the fun activities in Louisville up until October 31st. Jack O’ Lantern Stroll- Louisville Slugger Field will be hosting a family-friendly Halloween party on October 28th from 6-9 p.m. Come out to enjoy trick-or-treating, crafts, great food, and over 1,500 carved pumpkins. Halloween in Brown Park- Another family-friendly event! On October 29th, enjoy trick-or-treating (candy provided by local businesses), hay rides, bounce house, and many other fun games and activities for the kids. Trick-or-treating will take place between 11:30 a.m.- 1:30 p.m. but other activities will continue throughout the rest of the day. Brown Park is located by Baptist Hospital East in St Matthews. Pumpkinfest- On October 29th, Pumpkinfest will be taking over Jeffersontown’s Farmer’s Market Pavilion. This is a great free family-friendly Halloween event. 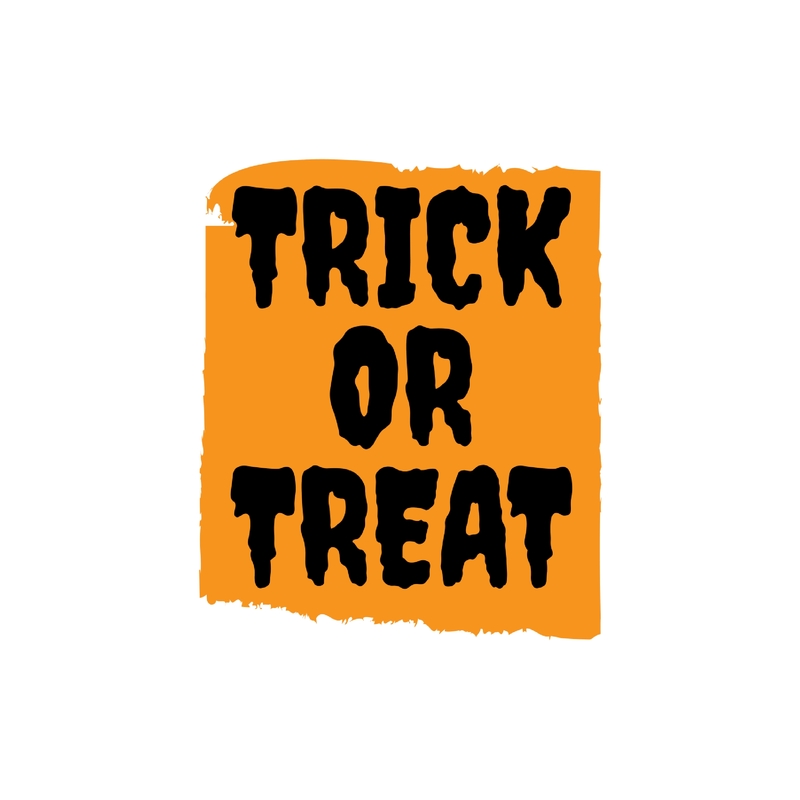 Trick-or-treating will go on between 11:00 a.m.-1 p.m. Free lunch will be provided as well. Halloween Comic Fest- Attention comic book lovers! This is an event you’ll want to attend. On October 29th, all comic book stores in the city will be showcasing their Halloween-inspired comic books as well as Halloween comic book merchandise. 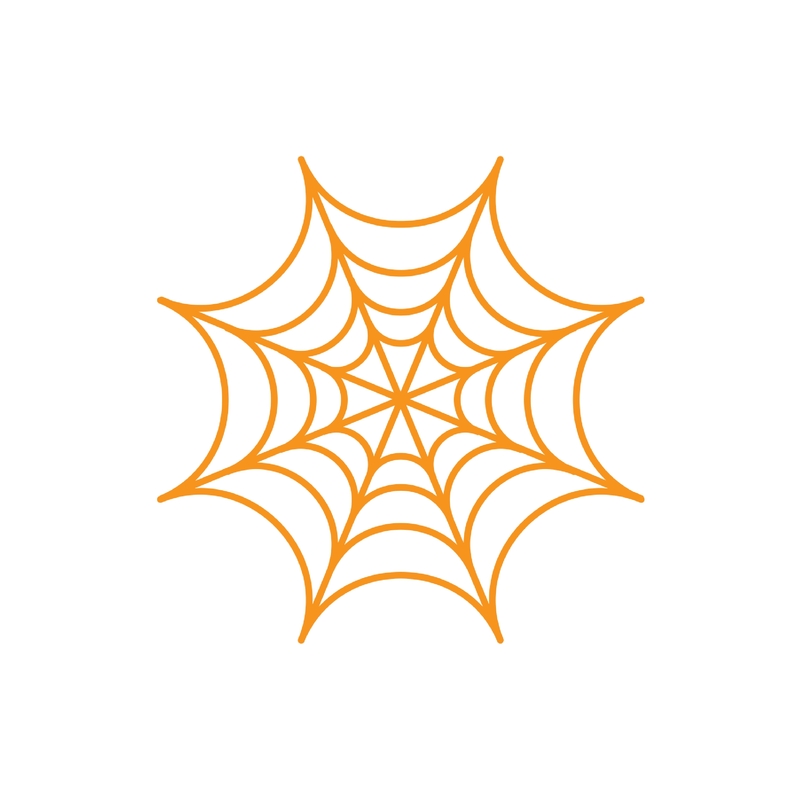 Halloween Family Fun Fest- Come out on October 29th to EXPO FIVE to celebrate Halloween Family Fun Fest hosted by Derby Park Flea Market and 7th Street Haunt. Halloween Family Fun Fest will include the following events: a costume contest, car show, and tricking or treating for the children. This event will last from 10 a.m. to 7 p.m. (trick-or-treating from 4 p.m. to 6:30 p.m.). Nightmare in NULU- From 12- 5 p.m. on October 29th, NULU will host a Halloween get together. There will be trick-or-treating, face painting, and pumpkin painting. After 5 p.m., there will be drink specials and a passport party. 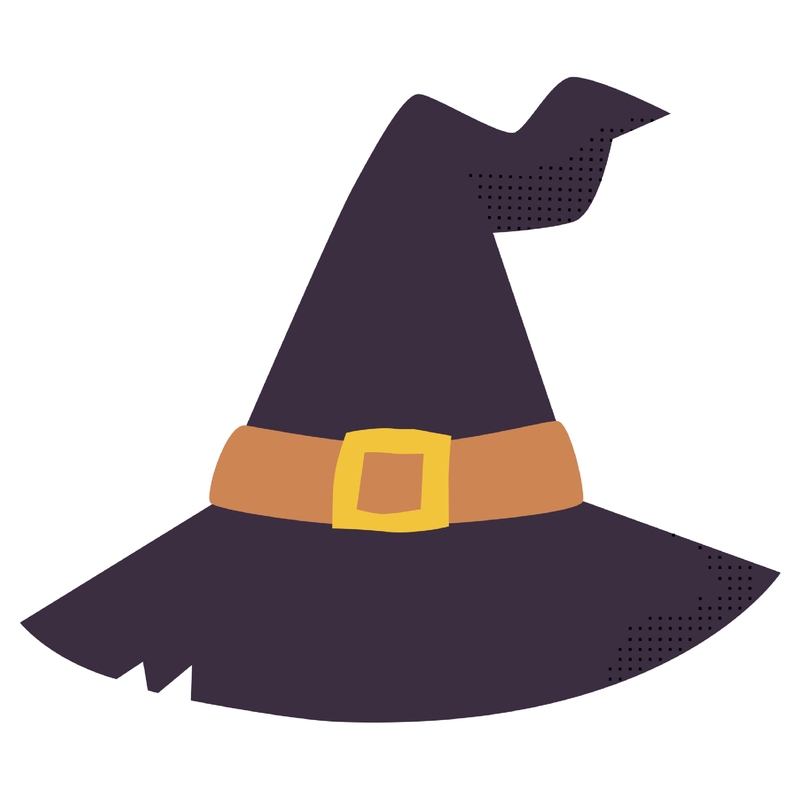 Norton Commons Fall Festival- This event will take place in the Norton Commons neighborhood on October 29th from 2-5 p.m. Children can trick or treat between 2-4 p.m. There will be plenty of fun activities for the whole family to enjoy. Twilight Tram- On October 29th, you can tour the beautiful Cave Hill Cemetery. The tour guide will discuss such things as famous monuments in the cemetery and the history of Louisville. Cave Hill Cemetery includes the gravesites of some of the most noteworthy people to live in Louisville such as Meriwether Louis Clark Jr. and Pete Browning. The cost of the tour is $35 per person. For more information, call 502.451.5630. Oktoberfest Cruise- The Belle of Louisville offers a family-friendly three-hour long cruise. With great food and live music, your family is sure to have a great time. You can purchase tickets that include your meal or purchase a ticket for just sight-seeing. Currently, October 22nd is the last date available to take the cruise. Ticket prices start at $30. 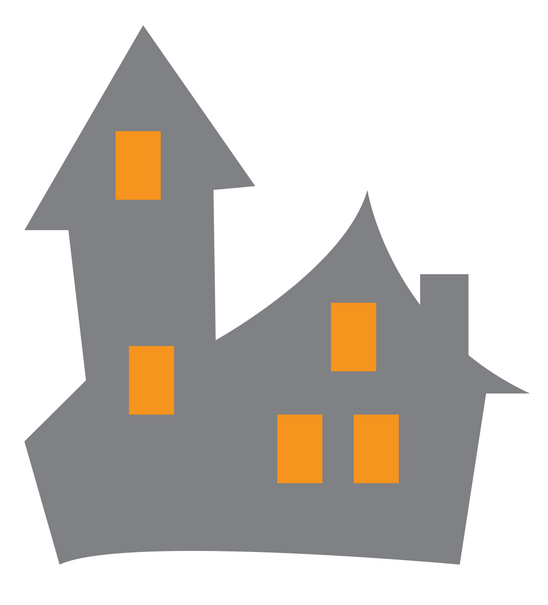 Monster Mash- Have a great time while giving back to a local non-profit organization. The Arrow Fund rescues animals that have been abused or neglected. All proceeds from this event will go to The Arrow Fund. This event will be hosted at Fourth Street Live and will include a costume party, live music, and a silent auction. There will be several drink specials as well. Admission is $20. This event takes place on Friday 10/21. Urban Bourbon Half Marathon- The Urban Bourbon Half Marathon is the most fun you’ve ever had while exercising! This 13.1-mile marathon moves from Scenic Loop then Cherokee Park and concludes on Main Street. On the way, you’ll enjoy music and live entertainment. Participants will receive bourbon themed gifts for participating. Celebrate the race afterward at the Belvedere. Prices start at $60. This event takes place on October 22nd. Boo Dell- Yew Dell is a beautiful botanical garden found in Crestwood. On October 29th, Yew Dell turns into Boo Dell to celebrate Halloween with the kids. Enjoy trick-or-treating from 11 a.m.-2 p.m. and other fun activities such as hayrides and scavenger hunts. You can also bring a Jack-O-Lantern decorated like your favorite storybook character for the Lantern Look-a-like contest. Admission is $5 per car or $1 per walk-in visitor. 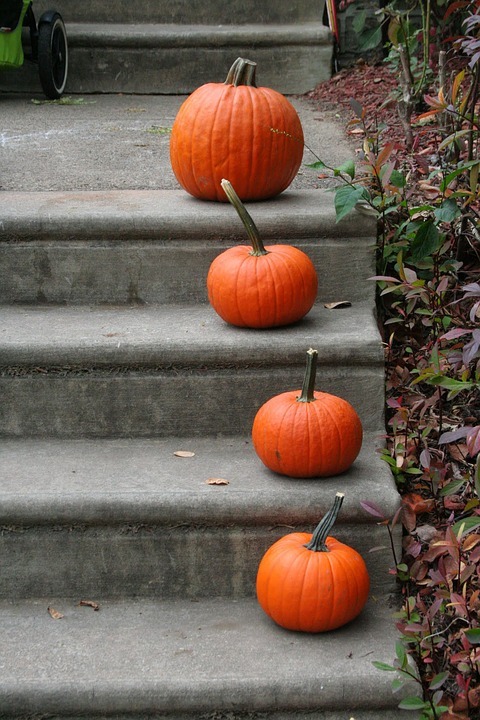 We hope that you enjoy this list of fun fall activities in Louisville. Feel free to leave comments regarding these events. Stay tuned for more blogs about events in Louisville. 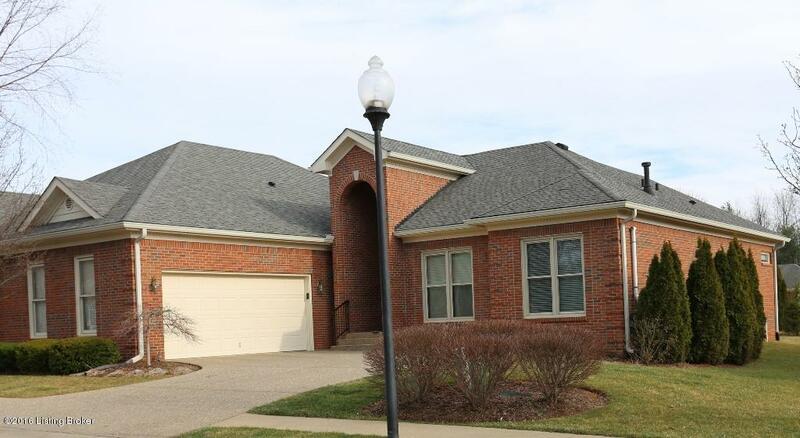 Located in desirable Floyds Knobs, this Woodfield Farms home is ready to welcome its new owners. As you approach this brick home located at 4307 Woodfield Drive, you will be captivated by the gorgeous lot this home sits on. This home is on a cul-de-sac street with plenty of space between neighbors. This neighborhood is perfect if you prefer the neighborhood setting yet want ample space between homes. The lot features many mature trees and lush green grass. Venturing inside, the large foyer sets the scene for this beautiful home. 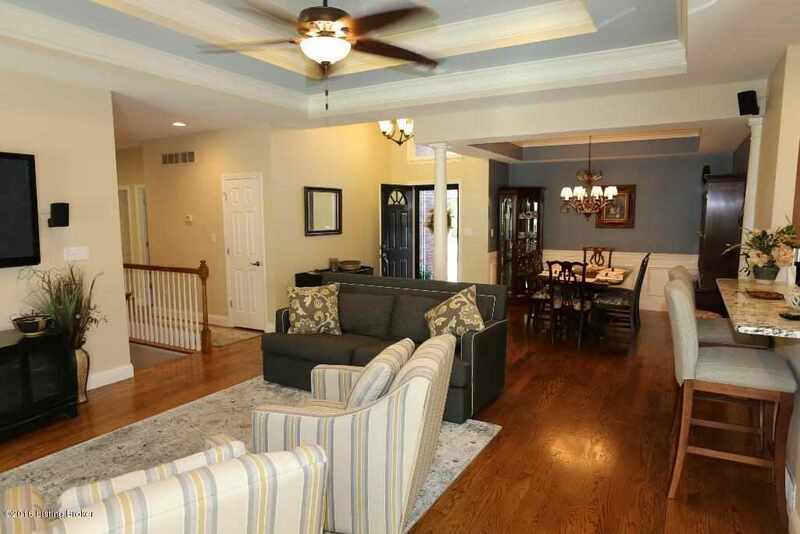 The foyer has great natural light streaming in from the windows and features hardwood flooring and crown molding. The staircase to the second floor of the home is located in the foyer. 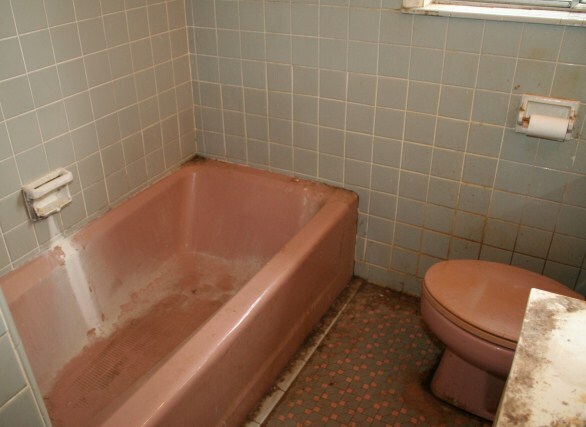 The half bathroom is also located in the foyer. In the half bathroom, you’ll see a lovely pedestal sink with oil rubbed bronze handles along with oil rubbed bronze towel holder and lighting. 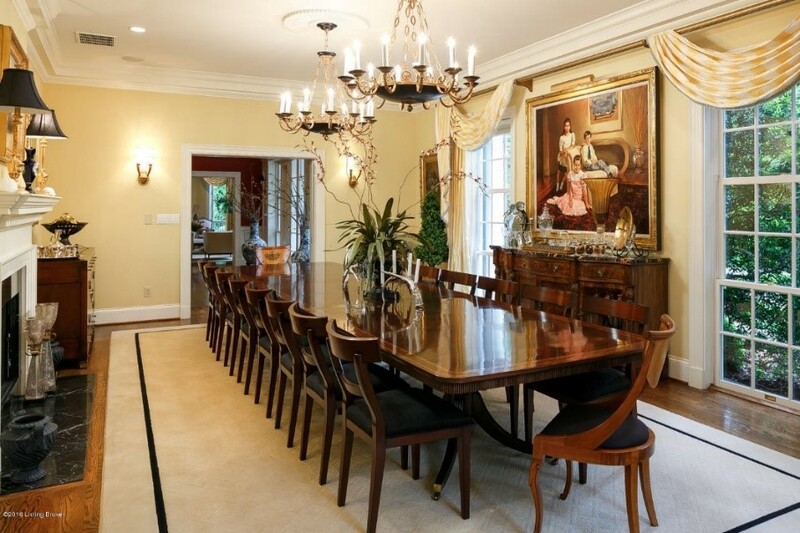 Located off of the foyer is the formal dining room. The formal dining room includes hardwood floors, wainscot, and crown molding. From the office, you can access the eat-in kitchen. The kitchen is completely updated and boasts newer cabinets, granite island, backsplash, stainless steel appliances (including a dual oven), hardwood floors, and crown molding. From the eating area, you can access the sunroom. The entrance to the sunroom is quite elegant as it features two gorgeous columns. 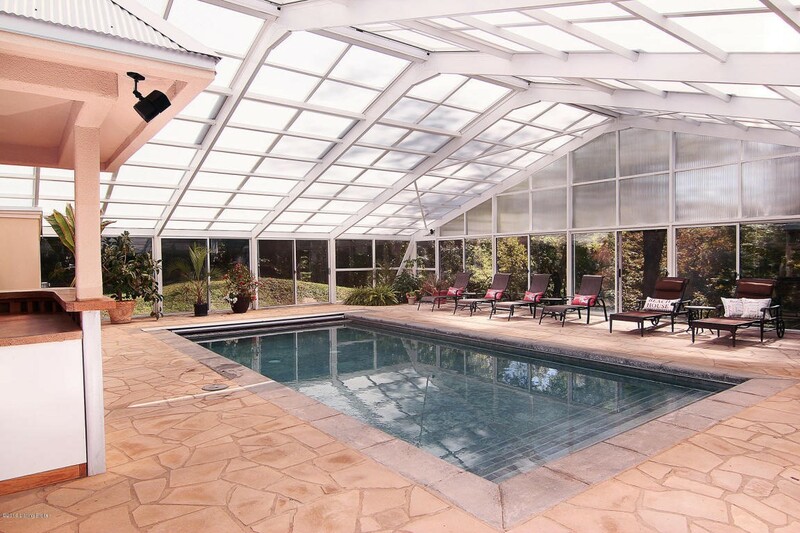 Inside the sunroom, you will find trey ceilings, large windows with views of the in-ground pool, and hardwood floors. The first floor also contains a family room and the owner’s suite. The spacious family room is well-lit and includes a fireplace, carpet, and can lighting. 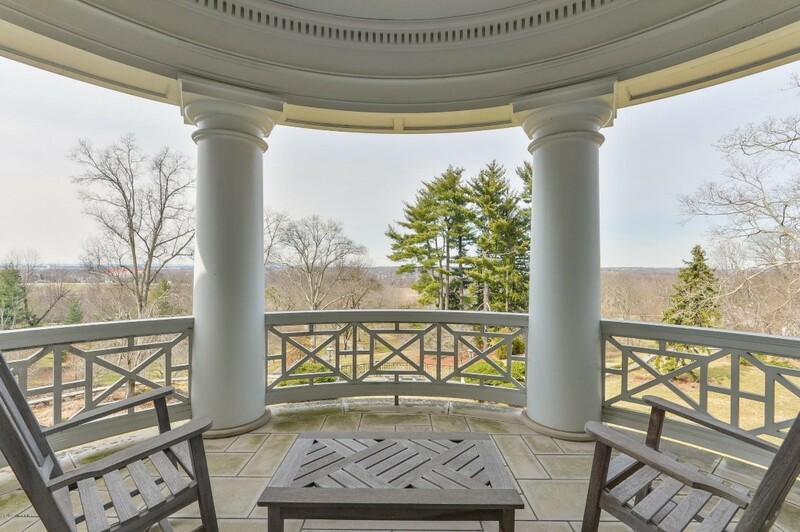 In the owner’s suite, you will see a Palladian window and two large bookcases. New carpet is being installed in the owner’s suite. Connected to the owner’s suite is the owner’s bathroom. There are many features to love in the owner’s suite but the luxurious whirlpool tub is especially a standout. The whirlpool tub boasts beautiful beige tile with two matching columns. 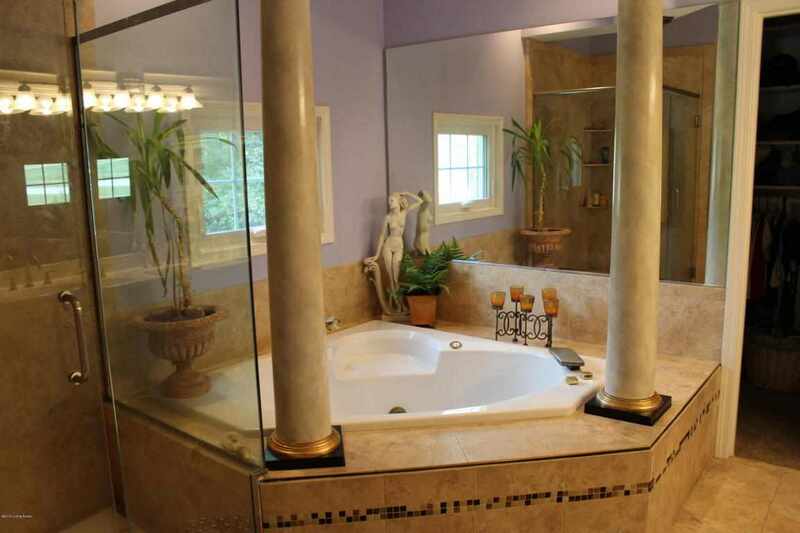 Other features of the owner’s bathroom include standup glass shower and crown molding. The walk-in closet is also located within the owner’s bathroom. The roomy walk-in closet includes built-in organizers and ample space for all your storage needs. Moving to the second floor, you will find two additional bedrooms and a full bathroom. Storage will never be an issue in the two additional bedrooms as each bedroom has TWO closets. 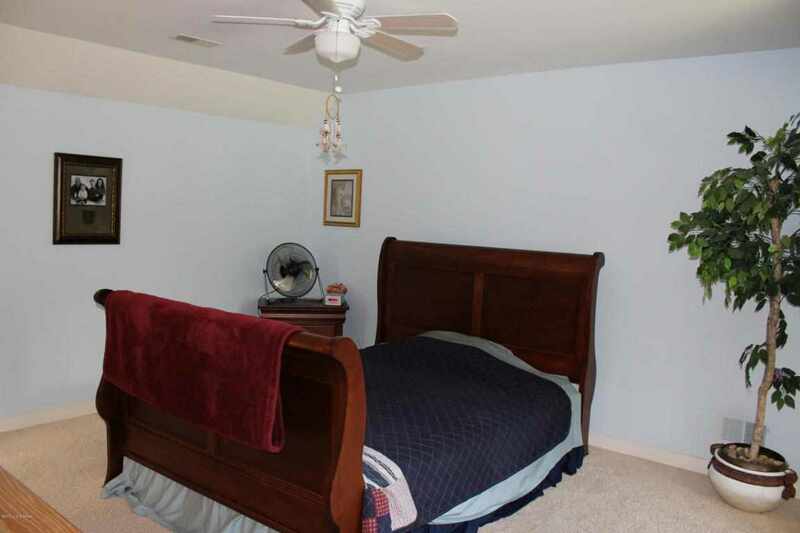 Each bedroom also includes a ceiling fan and carpet. One of the two bedrooms has a Palladian window with an attached bench situated by the window. 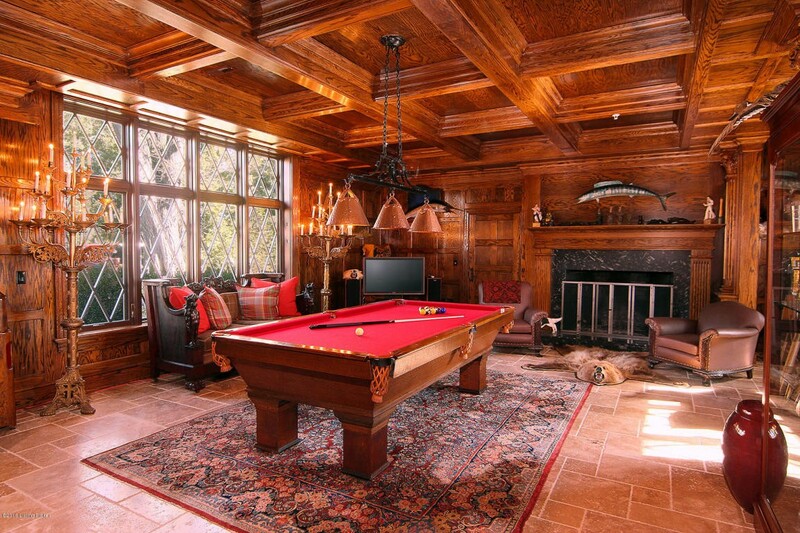 The basement is a great space for entertaining. 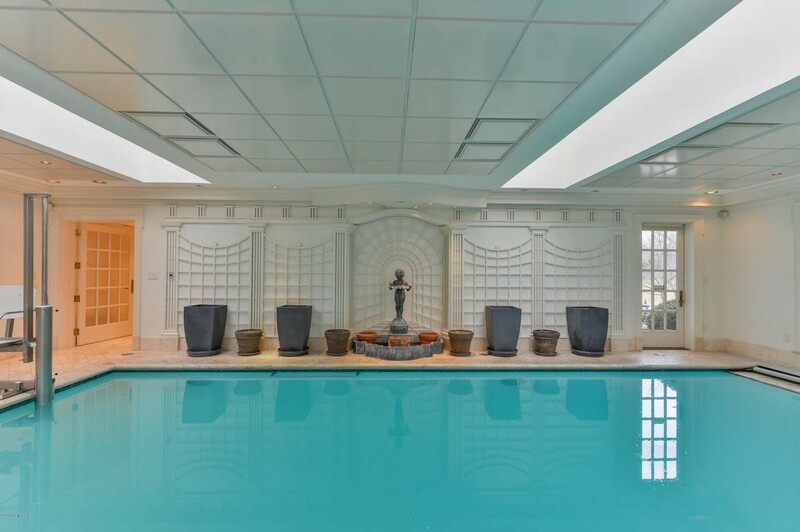 The basement boasts a family room, full kitchen, home gym area, bedroom, and full bathroom. The family room has enough space for a sectional couch or several furniture pieces. If you prefer not to have a home gym area, you could extend the family room area into a larger space to entertain. The kitchen features ample cabinet and countertop space. The outdoor area is one of the best features of this home. 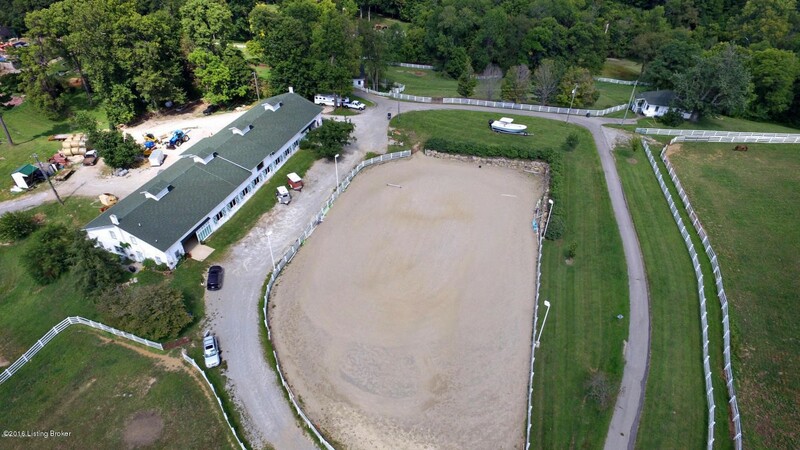 The spacious lot sits on .76 acres of land! Included on the lot is an in-ground pool (3’-5’ deep) surrounded by lush green landscaping. Surrounding the pool is a tall wooden privacy fence as well as a concrete area with plenty of room to sunbathe or host guests for a party. The remainder of the yard is tree lined and features a nice flat grassy area for all of your outdoor activities. For a private tour of this gorgeous home located at 4307 Woodfield Drive, known as Louisville MLS 1459788, give the Hollinden Team a call at 502-429-3866. If you want to see other homes for sale in Woodfield Farms, The Hollinden Team can help you with that as well. 10122 Cave Creek Road is now under contract. Stay tuned for future opportunities or call The Hollinden Team at 502-429-3866 for more information homes in Forest Village. Located in desirable Forest Village neighborhood, 10122 Cave Creek Rd. is a newly listed gem awaiting new owners. Forest Village is a patio home community located directly off of Hurstbourne Lane in Lyndon, within close proximity to Middletown. At first glance, you will be awestruck by the attention to detail and renovations that have been made to this home. Once you see this patio home, it should come as no surprise that the current owners have invested $60,000 into the renovations. 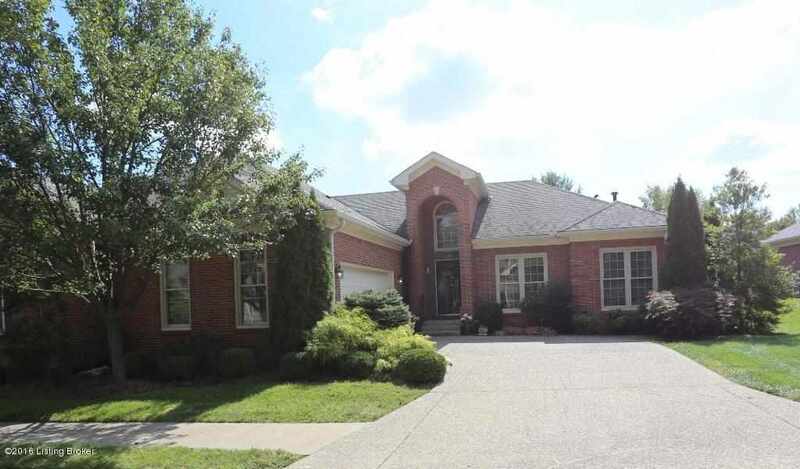 Drive up to this all brick patio home and you are welcomed by a meticulous landscaping and beautiful curb appeal. To keep the landscaping in pristine condition, an irrigation system has been installed. The two car garage is attached to the front of the home. In addition, the driveway is wide, allowing plenty of space for guest parking. The entryway to the front door of the home creates a very stately look to the home. Upon entry of the home, you are greeted by a two-story foyer. Throughout the first floor, solid 4" red oak flooring has been installed (including great room, informal dining space, hallway and master bedroom). Additionally, baseboard trim has been upgraded to 5.25" stock throughout the house. You will also notice the fresh paint throughout the entire home. The current owners carefully chose colors that were soft yet reflected current paint color trends. The great room is straight ahead from the foyer. The great room boasts multi-trey ceilings, a gas fireplace (with remote control), and a neutral paint color. To the left of the foyer is the formal dining room. The entry to the dining room features two lovely columns. Other features in the dining room include wainscot, updated chandelier, and crown molding. The size of the dining room is equipped for a large crowd as it currently houses a ten-seat formal dining set with side pieces. To the left of the dining room is the eat-in kitchen. In the kitchen, no expense has been spared. 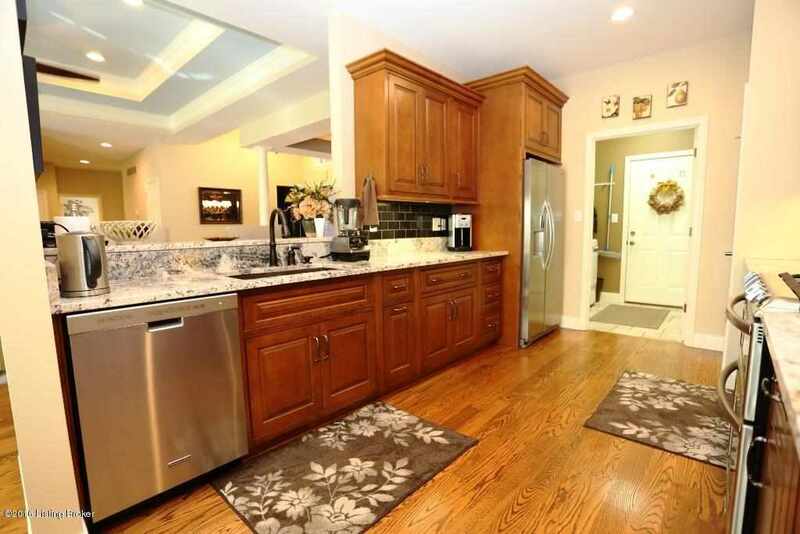 In fact, the current owners invested $25,000 in the remodel of their kitchen. The updated features of the kitchen include new premium soft-close cabinets, granite countertops, new tile, new KitchenAid stainless steel appliances, under-cabinet lighting and a granite breakfast bar. The kitchen is large and wide, making plenty of room for traffic when entertaining. The eating area allows enough space for a large kitchen table and plenty of natural light. Exiting the eating area, you will find the light-filled sun porch connected to the great room. This space is an excellent space for a conversational area. Guests will enjoy the large windows with views of the outdoor wooded area and the surround sound speakers. From the sun porch area, you can access the outdoor back porch. Moving to the right wing of the home, you will find three bedrooms and two bathrooms. 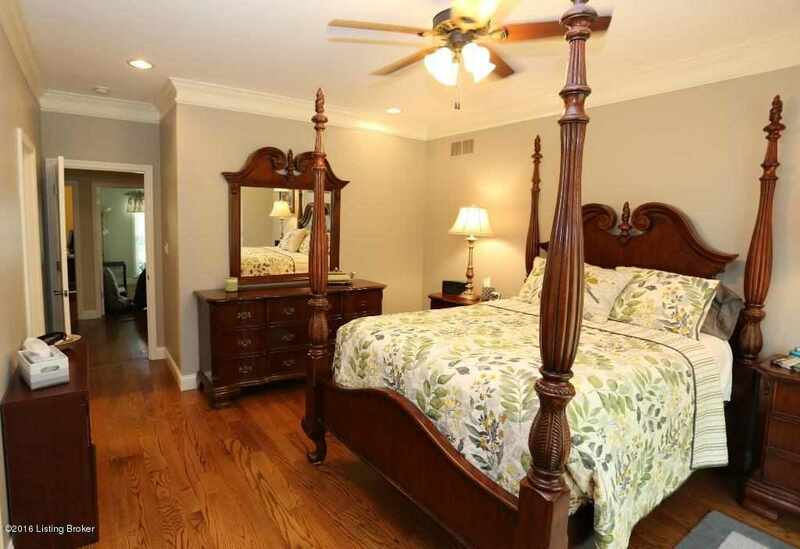 The owner’s suite boast crown molding, updated brushed nickel ceiling fan, and a LARGE walk-in closet. The walk-in closet is equipped with plenty of shelves and racks for storage. The owner’s bathroom features a granite vanity, plenty of cabinets, and a walk-in shower. Every fixture in the owner’s bathroom has been updated to oil-rubbed bronze. The two additional bedrooms feature pre-finished hardwood. The second bathroom on the first floor features granite and new lighting/plumbing features. Moving to the finished basement, you will first notice the solid red oak treads on the steps. The treads were a recent renovation as the steps formerly were carpeted. 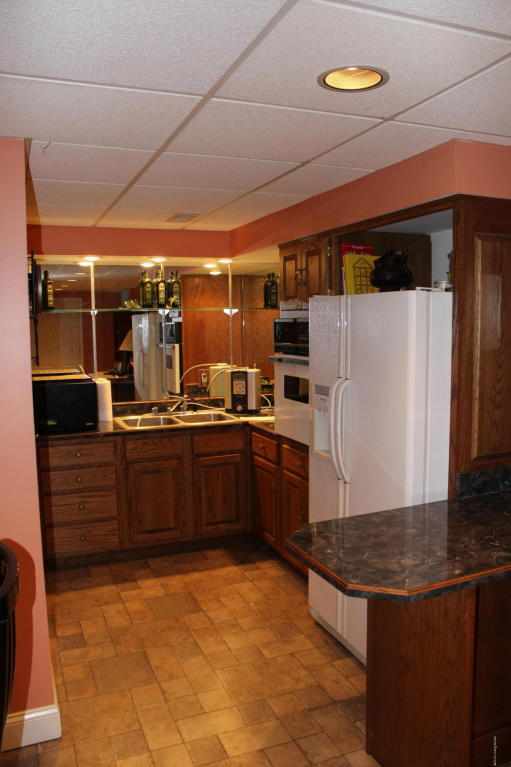 The basement is the perfect space for entertaining and has been completely renovated. Features of the basement include a large entertainment area with wet bar and gas fireplace (with remote control), a theater room in a large alcove, and all new paint and carpet. In addition, there is a non-conforming bedroom, updated full bathroom, and storage/mechanical area with over 200 feet of shelving. Not only will you fall in love this patio home but you will also love the area. This community is conveniently located to expressways and shopping. For grocery shopping, both Kroger and Walmart are under ten minutes away. Lucky’s Market is about three minutes away. If you are looking for shopping centers, Forest Village is within ten minutes of The Paddock Shoppes, Springhurst shopping center, and Middletown Commons. The YMCA is within three minutes of Forest Village. Also, Forest Village is very well-maintained. Each lot is beautifully manicured. There are lovely walking trails in the front of the neighborhood. For a private tour of this gorgeous home located at 10122 Cave Creek Rd, known as Louisville MLS 1459875, give the Hollinden Team a call at 502-429-3866. If you want to see other homes for sale in Forest Village, The Hollinden Team can help you with that as well. Welcome to 10602 Elder Lane! This five bedroom and three-and-a-half -bathroom home is located in the desirable Prospect golf community, GlenOaks. GlenOaks is accessible by taking Brownsboro Road to Worthington Lane. 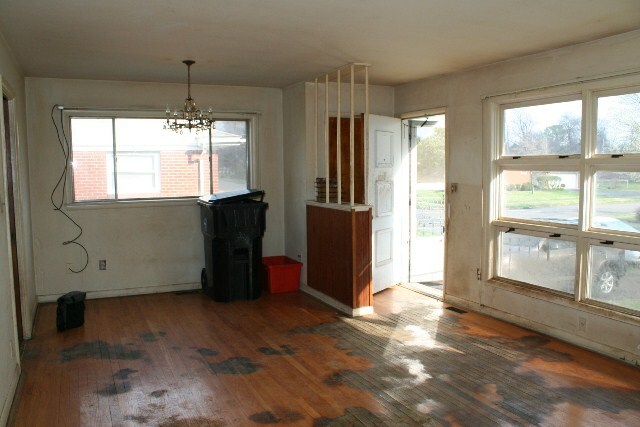 As you approach this home, you will first notice the curb appeal. 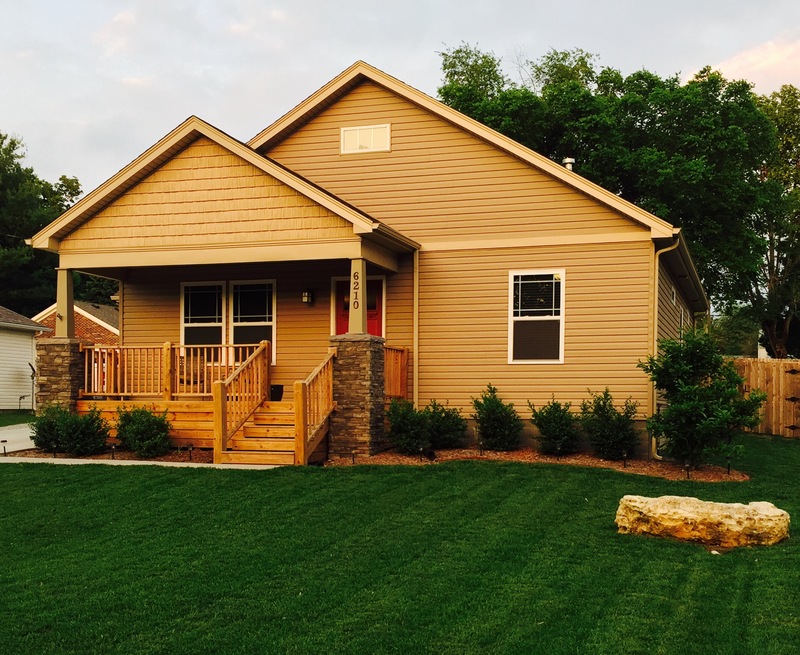 The landscaping is nicely maintained and the front of the home is inviting. There are a few rose bushes in the landscaping and a lovely water fountain. On the front of the home, there is a covered porch large enough to put a table or a swing. The stunning glass entry door adds to the curb appeal. The foyer boasts a neutral paint color, hardwood floors, trey ceilings, and updated cage pendant lighting. To the left of the foyer is the dining room. The dining room features neutral paint color, wainscoting, an updated rubbed bronze light fixture, hardwood floors, large windows, and arched entryways with columns. The owner’s suite is straight off of the hallway. The owner’s suite is quite spacious and includes the following: double trey ceilings, windows with views of the rear of the home, a neutral paint color, and carpet. 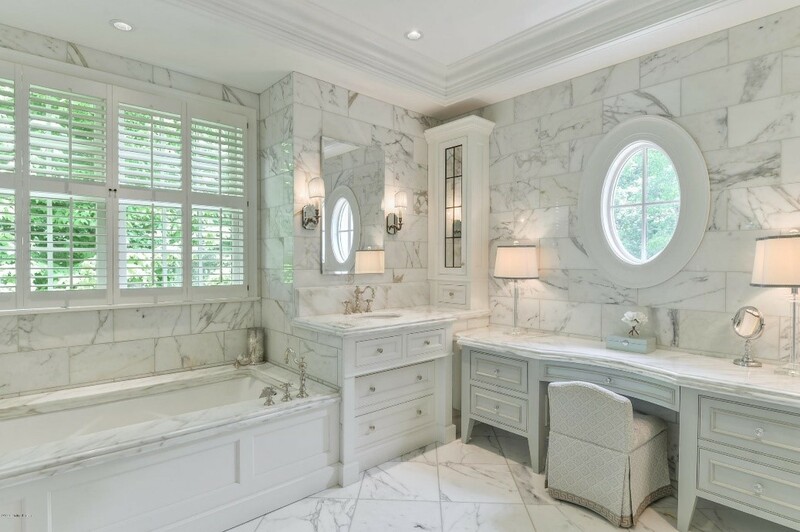 The owner’s bathroom includes dual vanities, ample cabinetry, rubbed bronze hardware on doors, heart shaped whirlpool tub, separate marble corner shower, and a toilet room. The walk-in closet is also accessible from the owner’s bathroom. The walk-in closet features plenty of shelves and racks for clothing and storage. Take a right out of the owner’s suite and you will enter the great room. The great room includes a corner gas fireplace with marble hearth, updated ceiling fan, hardwood floors, a neutral paint color, crown molding, arched entryway with columns, and plenty of windows to let in natural light. The eat-in kitchen is parallel to the great room. The kitchen boasts custom cabinets with lighting underneath, granite countertop, ceramic tile backsplash, hardwood floors, new stainless steel appliances (all appliances remain), breakfast bar, and center island. 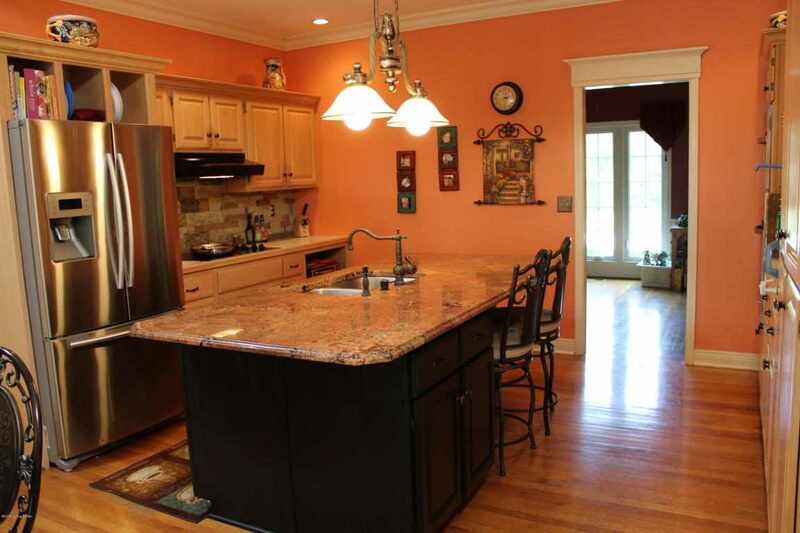 There is plenty of counter space in the kitchen, allowing a lot of room for meal preparation or serving food to guests. The eating area includes bay windows and an updated light fixture. The dining room, great room, and kitchen flow into each other nicely, making a perfect space for entertaining. In addition, there is also a half bathroom and laundry room on the first floor. The laundry room has wainscoting and shelves for storage. 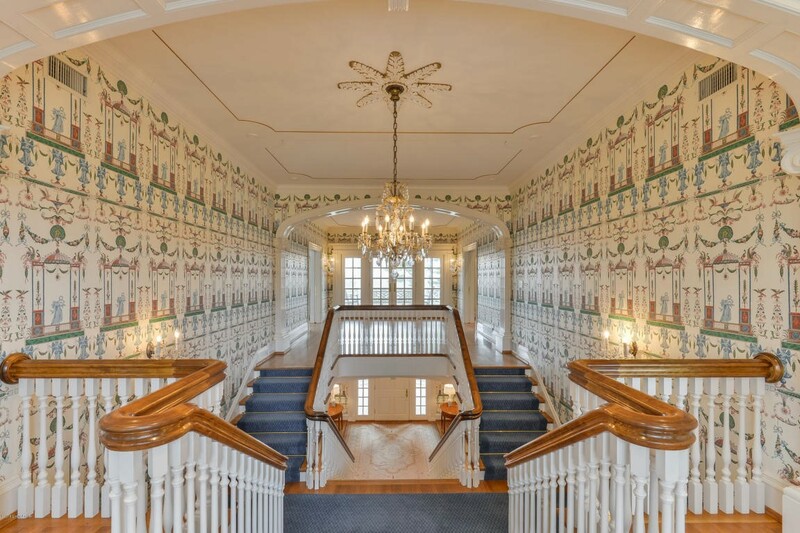 Walking to the second floor, you will notice the gorgeous banister with iron spindles. Once you have approached the top of the steps, you will see the loft area first. The loft area has vaulted ceilings, skylights, carpet, and a ceiling fan. The loft could be used various ways such as an office, playroom, or another great room. 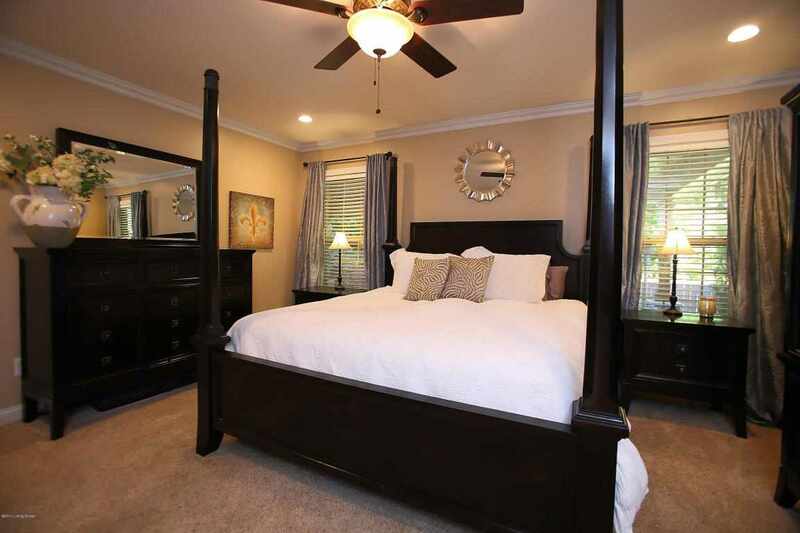 There are three large bedrooms on the second floor that include ceiling fans, walk-in closets, and carpet. There are also two bathrooms on the second floor that include ceramic tile, marble vanities, and linen closets. One of the two bathrooms is an en-suite bathroom. 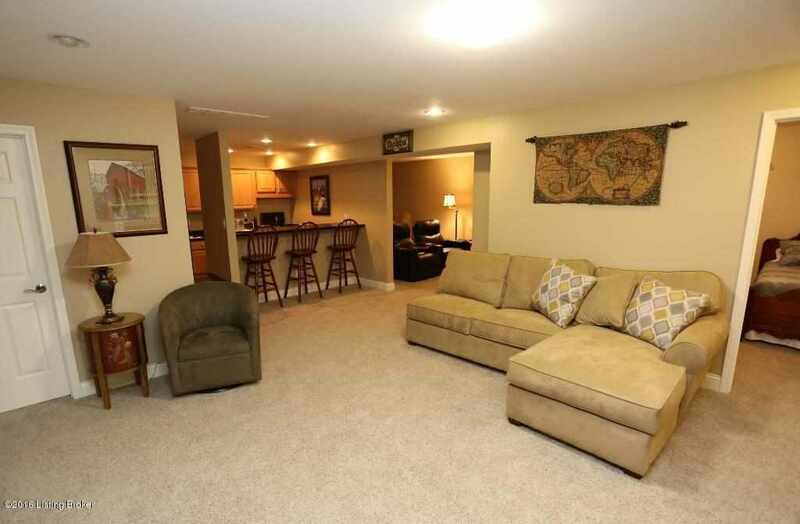 Moving to the lower level walkout basement, you are greeted by the spacious family room. The family room features a corner gas fireplace with a ceramic tile hearth, carpet, and a neutral paint color. Also in the basement is the home office/fifth bedroom. This room includes hand scraped hardwood floors, egress windows, and walk-in closet. This room also provides access to a small paver patio. There are 2 - 15 light French doors that separate the office/fifth bedroom from the family room. The lower level is also roughed in for a full bath. In addition, there are two unfinished areas in the basement. There is an unfinished room with egress windows that could be used as a sixth bedroom. Also, there is another unfinished area that is currently being used as a storage/workshop area. On the back of the home, you’ll find a large covered deck with ceiling fan. The professionally landscaped backyard is very private and is lined by mature trees. The 3.5 car garage offers plenty of space for storage. For a private tour of this gorgeous home located at 10602 Elder Lane, known as Louisville MLS 1459080, give the Hollinden Team a call at 502-429-3866. If you want to see other homes for sale in GlenOaks, The Hollinden Team can help you with that as well. 3223 S Winchester Acres Road is now under contract. Stay tuned for future opportunities or call The Hollinden Team at 502-429-3866 for more information homes in Winchester Acres. 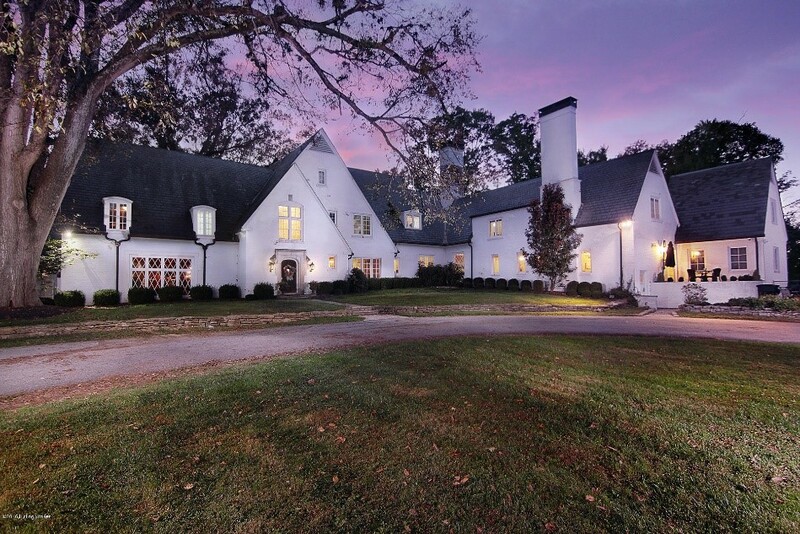 Welcome to 3223 S Winchester Acres Road! 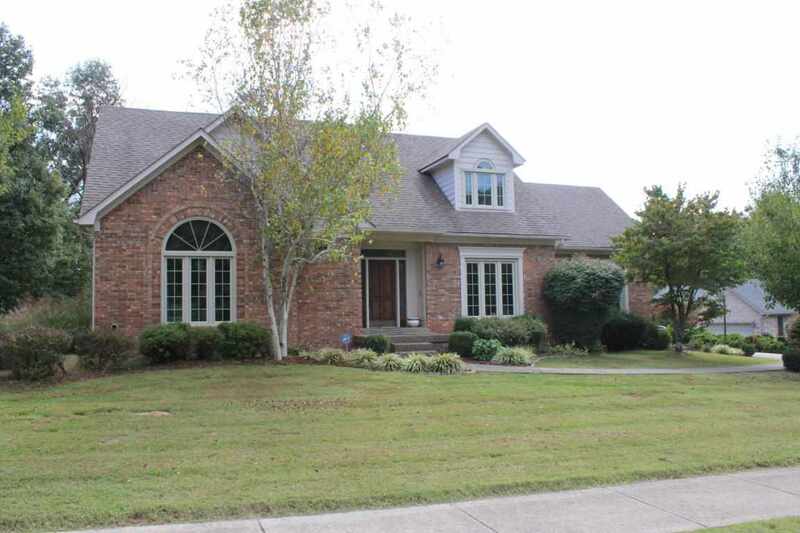 Built in 2003, this custom built brick home is located in the Winchester Acres subdivision off of Old La Grange Road. Drive up to this lovely home and you are greeted by mature trees and a well-maintained landscaping. This home is located on a secluded cul-de-sac, providing privacy for the owners. Walk up to the front of the home and you will see an elegant partially glass front door. The landing to the front door is large, allowing for plenty of room for potted plants or decorations. Enter the home and you will see the spacious and bright two-story foyer. 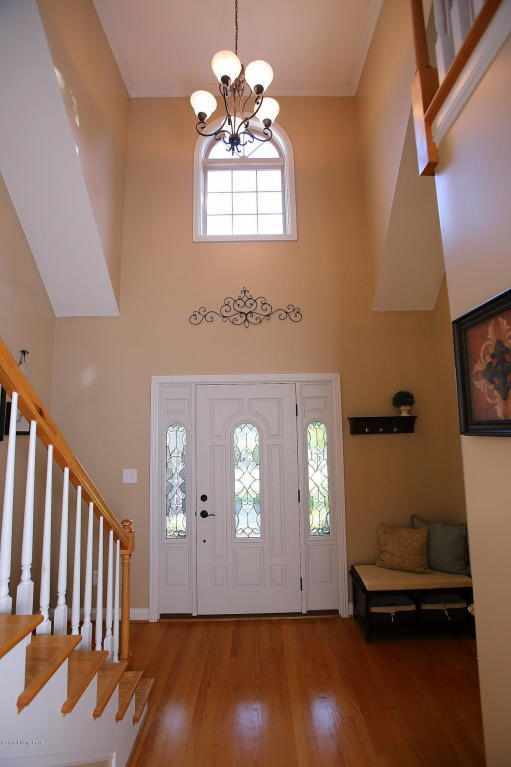 The foyer has neutral paint, hardwood floors, and vaulted ceilings with a modern chandelier. To the left of the foyer is the dining room. The dining room features crown molding, a modern chandelier, and vaulted ceilings. The half bathroom is located in the hallway between the foyer and the kitchen. In the half bathroom, you will find hardwood floors, updated wood vanity, neutral paint color, and oil rubbed bronze faucet. Walking straight down the hall from the foyer, you will enter the great room. The great room boasts neutral paint color, vaulted panel ceilings, new crown molding, and a fireplace. From the great room, you can access the eating area, allowing for a nice flow when entertaining. The eating area has plenty of space for a large kitchen table. The eat-in kitchen is spacious, making it the perfect space to entertain. 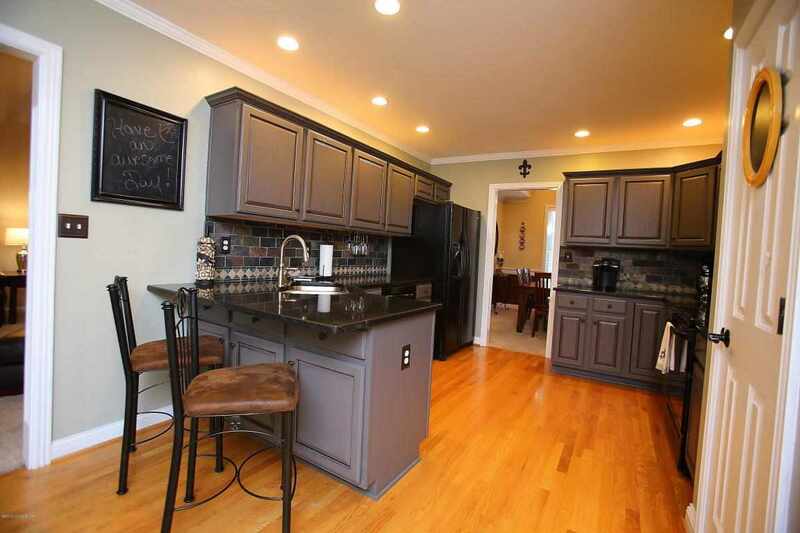 The kitchen boasts black granite countertops, hardwood floors, new crown molding, and an updated backsplash. Also on the first floor, you will find the owner’s suite. The owner’s suite has neutral colored walls, updated ceiling fan, and windows facing the backyard. Enter the owner’s bathroom through the lovely French doors. The owner’s bathroom includes dual vanities, ceramic tile floors, Jacuzzi bathtub with a separate shower, and toilet room. The walk-in closet is accessible from the owner’s bathroom. The walk-in closet features numerous shelves and racks, offering a multitude of storage options. On the second floor, there is a catwalk with views of the foyer and great room. There are three bedrooms and one bathroom on the second floor. Each bedroom has a closet and ceiling fan. 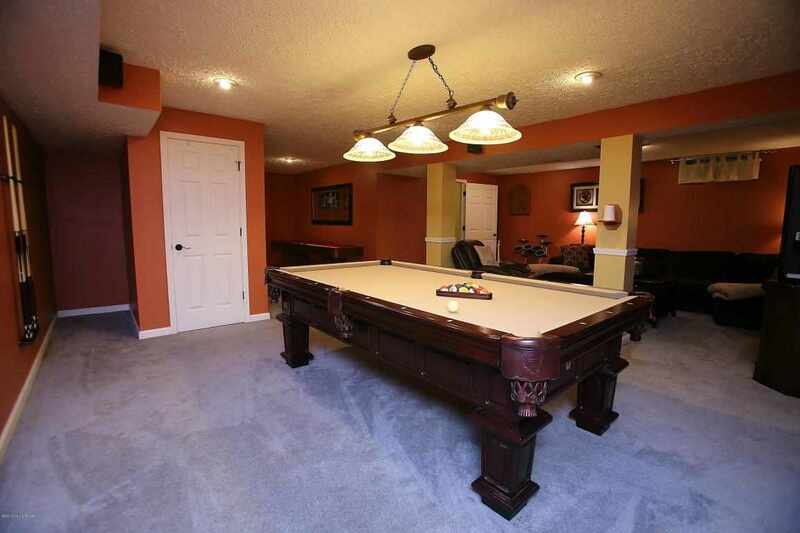 The finished basement is a perfect space for entertaining. The layout is very open and spacious, allowing plenty of room for guests. There is an additional room in the basement that is being used as a playroom. Moving to the back of the home, you will be impressed with the covered patio. 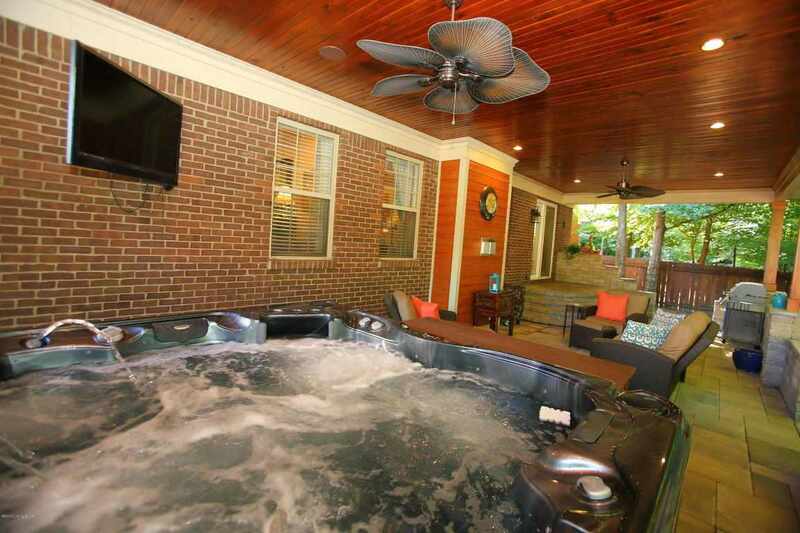 The patio boasts wood paneled ceiling with can lighting, hot tub, and two tropical leaf ceiling fans. The patio is yet another great place to entertain guests at this house year around. 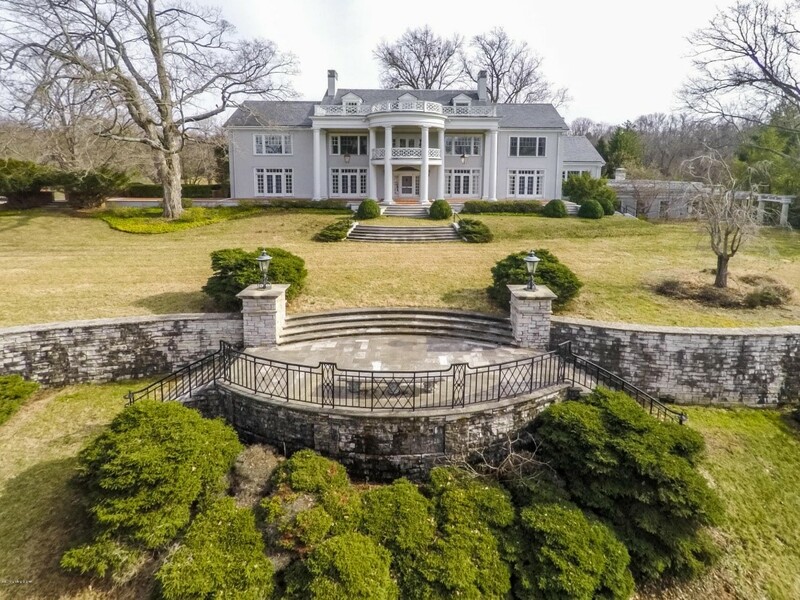 For a private tour of this gorgeous home located at 3223 Winchester Acres Road, known as Louisville MLS 1458592, give the Hollinden Team a call at 502-429-3866. If you want to see other homes for sale in Winchester Acres, The Hollinden Team can help you with that as well. Saving for a downpayment on a home can be difficult, especially if it is your first home. I know that when I was saving for my first home, I have to develop a strategy in order to save money each month. The first question most prospective home buyers ask is, “how much money do I need to put down?” It is most often suggested to have a 20% down payment when purchasing a home. 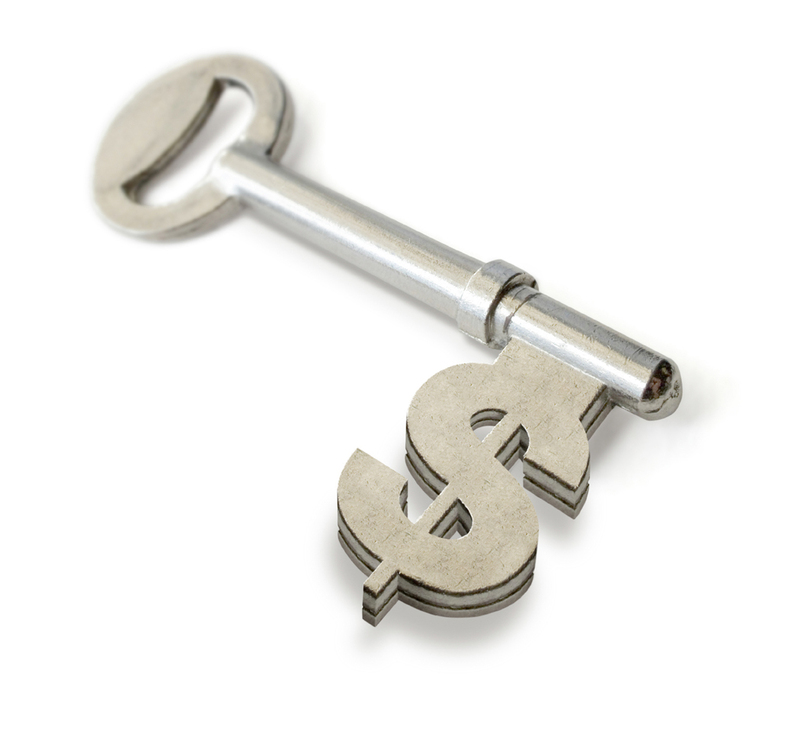 Twenty percent down payment helps avoid Private Mortgage Insurance (PMI). PMI can cost homebuyers several hundreds of dollars a month. If you are unable to put 20% of the sales price down, there are loan options that allow you to put 3.5% down. Some loan programs even allow you to put just one percent down! Get Preapproved- The first step in saving for a down payment for a home is knowing how much you can afford. You can do this by setting up an appointment with a lender. The Hollinden Team has preferred lenders that we can recommend to you. Determine How Much You Want to Spend- When your lender preapproves you for a loan, he should be able to give you an idea of what your monthly mortgage payment will be based on sales price and interest rate. The lender will also be able to determine the down payment necessary based on the price of the home. After examining these numbers, you should begin to determine what you can afford. If you have not visited a lender yet, feel free to use our mortgage calculator. Keep in mind, interest rates sometimes fluctuate. Fluctuation will impact your projected monthly mortgage payment and your down payment. Keep in contact with your lender to stay up-to-date on the latest interest rates. Set a Timeframe- Your timeframe to move really depends on how much you need to save for a down payment. If you need to move quickly and don’t have much money saved up, you may want to consider purchasing a cheaper home. Create a Budget- Listing all of your expenses and where your money is going every month makes people more accountable and aware of how they spend their money. You may find that you are spending money on unnecessary items that can be cut out. Cut Out Unnecessary Spending- Do you really need that $5 Starbucks latte every morning? Could the beach vacation wait this year? There are probably many expenses you could cut out of your budget. If you are trying to aggressively save for a down payment, anything that is not a necessity should be cut out of your monthly budget. Create a Savings Account- Your checking account and savings account should never be bundled in one account. It is best to separate these accounts so that you know which money is off-limits. Treat Savings like a Bill- Just like your cable bill or water bill, saving money every month should be treated like a bill you have to pay. When you do this, you become more disciplined when saving your money. To ensure that you pay your monthly savings ‘bill’, consider setting up a monthly automatic deposit from your checking account to your savings account. 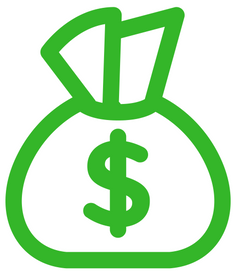 Cash Reward Credit Cards- Cash reward credit cards are a great way to save money for your down payment. Chase Freedom Unlimited, Bank Americard Cash Rewards, Citi Double Cash Card, and Capital One QuickSilver are just some of the few credit cards that offer cash back options. Sell Unused Items- We all have items that we aren’t using. Consider selling the items on Craigslist, Facebook Yardsale, or Ebay. Avoid Car Payments- If your car is already paid off, consider keeping your vehicle rather than purchasing a new one. Not having a car payment can save a tremendous amount of money monthly. Downsize- If you live in an apartment, consider downsizing to a smaller apartment to save money. You could also look into other apartments in the area. You may be able to find an apartment cheaper than the one you are living in for the same size. Often, apartment communities offer promotions to new residents. This could be something you could take advantage to save money. Another option is moving in with family. This isn’t always realistic for some but if you are able to do this, you could save a lot of money. Do you have any questions or comments regarding saving money for your down payment? Are there any other money saving tips that you’ve tried that we didn’t mention? Leave your questions and comment below. Feel free to call the Hollinden Team with your questions as well: 502-429-3866. USDA stands for United States Department of Agriculture. The USDA’s Rural Development (RD) loans are for homes in rural areas. These are commonly referred to as RHS loans or Rural Housing Service loans. Most of our clients use the guaranteed program as opposed to RHS direct. There are some requirements to obtain an RD loan, including the particular rural area the home is in. Not all rural areas qualify for a USDA loan. USDA will make the determination regarding which areas will qualify. In Kentucky, Jefferson County is not eligible for USDA loans. However, USDA loans are eligible in areas such as Bullitt County, Oldham County, Spencer County, Nelson County, and much more. Although USDA loans are eligible in these areas, USDA will make the final determination where or not a home qualifies for a USDA loan. Also, there are some household income requirements in order to obtain an RHS loan. Some of the questions asked by USDA regarding income eligibility are the number of people in the household, the number of residents under 18 years old, the number of disabled residents or full-time students, and loan applicants or co-applicants age 62 or older. USDA also requires that homebuyers occupy the home as their primary residence. For more information, visit the USDA eligibility section on the website. 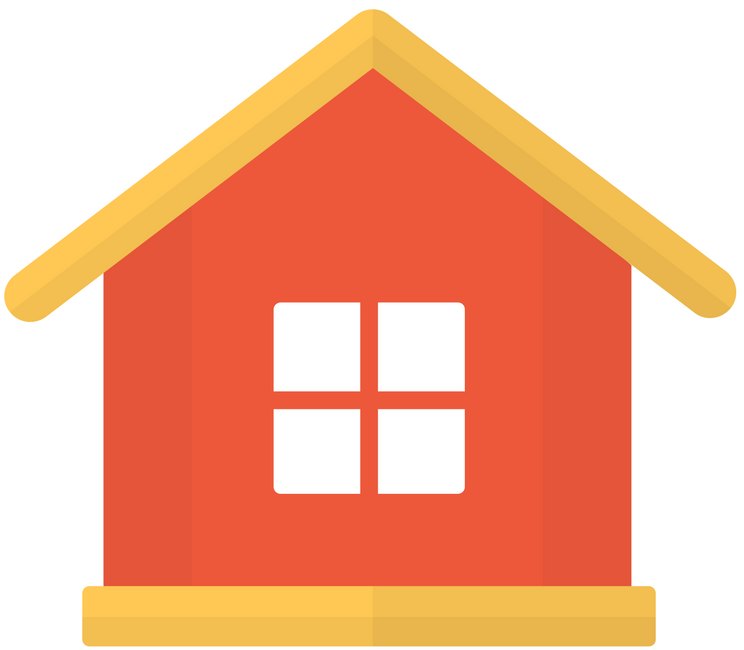 You can type in the address of the home that you have an interest in to see if is eligible. USDA/RHS loans offer 100 percent financing, which means as a buyer you aren’t required to put down any money when you purchase the home. This is uncommon amongst loan programs unless you are a veteran and obtain a VA loan. If 100 percent financing wasn’t enough, USDA has also reduced some of their fees! Currently, USDA mortgages charge the following fees: an upfront guarantee fee and an annual fee. Starting October 1, 2016, these fees will be reduced. As of right now, the current upfront fee is 2.75% and the current annual fee is 0.50%. The new upfront fee will be 1.00% and new annual fee 0.35%. The reduction of fees will last up until September 30, 2017. Another reduction is possible in 2017. Usually, USDA will examine financial information and make a decision whether or not more reductions should be made or raise fees again. USDA announced that the reason behind this reduction in fees is due the performance of current borrowers (Lane,2016). Do you have any questions or comments regarding USDA's fee reduction? Please leave your questions and comments below. If you would like to speak to a lender about obtaining a USDA loan, contact the Hollinden Team. We have preferred lenders that we can recommend to you. 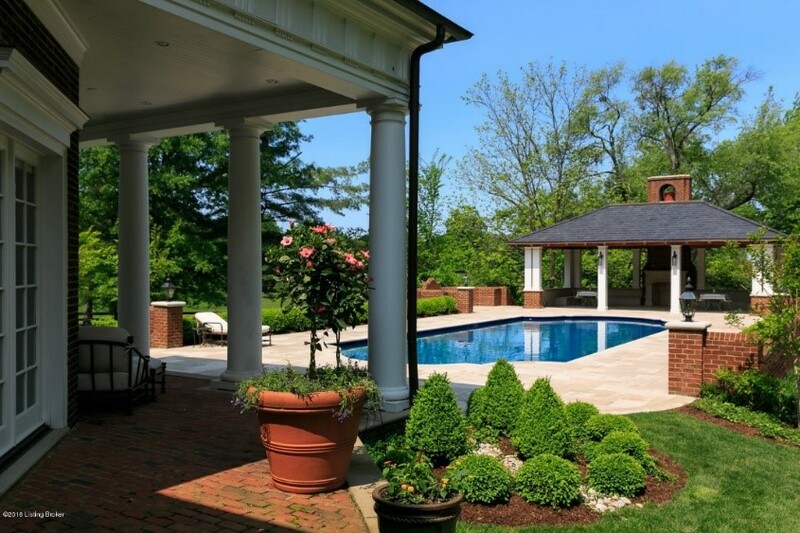 Patio Home Living in Louisville: Is it Right for Me? Yardwork Eliminated- Depending on the size of your yard, you should expect to spend two to four hours a week on yard work in a single family home. A yard involves a lot of work such as mowing, edging, weed removal, watering, and fertilizing. How nice would it be to not have to worry about yard work? In a patio home, yard work is nonexistent. 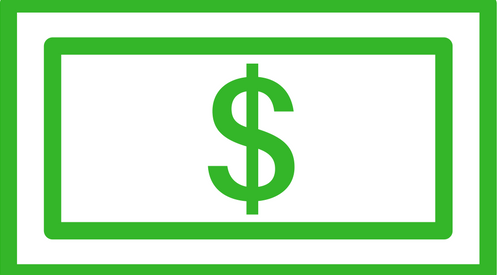 You will pay a monthly homeowner’s association fee that covers the upkeep of your lawn. The time that you would be dedicating to your yard, you can spend doing things you enjoy. Generally speaking, the HOA will take care of your shrubbery and mulching. And, don’t forget the leaves in the fall. Few people enjoy raking and disposing of the leaves! Exterior Maintenance- A typical patio home community will take care of the outside maintenance of your home. This may include painting, roof repairs, gutter cleaning, tree trimming, etc. Less Space to Upkeep- Although patio homes vary in square footage, often times people will choose patio homes with less square footage so that there is less to maintain. Anyone that has owned a single family home knows how much time is involved in cleaning. Less square footage means less time spent on cleaning. 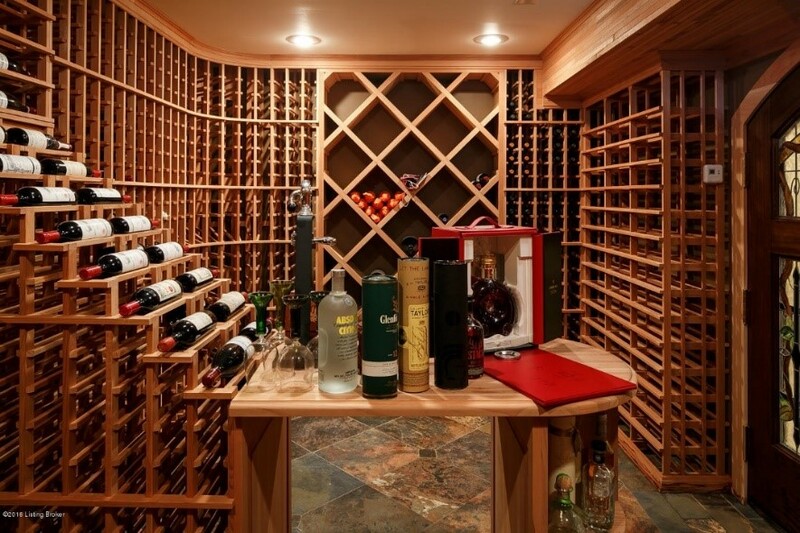 Basements- Living in a patio home doesn't mean that you have to give up having a basement. For those that still want a basement, patio homes with basements are very common. Forest Village patio homes and many other patio home subdivisions in Louisville have basements. More Time to Enjoy Life- With less yard work and home to maintain, you should have more time to enjoy life. This is one of the most common reasons people choose patio home living. More Affordable- Patio homes tend to be more affordable than single family homes. Usually, you can get the same modern day bells and whistles that a single family home would offer but for a fraction of the cost. Fewer Neighbors- Compared to condominiums, patio home subdivisions typically have fewer residents. It is pretty common to just share one wall. That is almost a misnomer, as often there are two walls with a fire break which does double duty for safety and noise concerns. Condominium complexes usually have more residents because there are two to three floors of condos in each building. In a patio home, you don’t have to worry about having neighbors above or below you. This results in less noise and more privacy. Patio home living isn’t for everyone but it would be something to consider if you wanted less responsibility when it comes to a home. 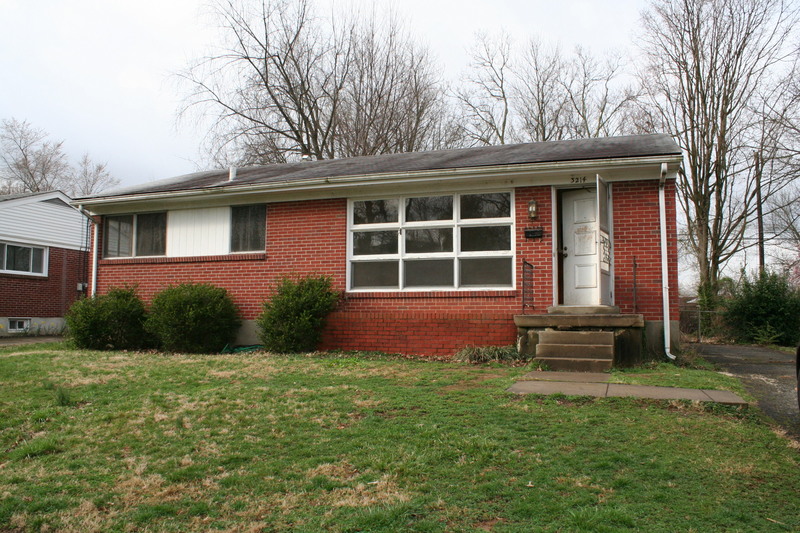 You can view all patio homes for sale in Louisville and surrounding counties on our website. For more information, call us at 502-429-3866. What are your thoughts on patio home living? Would you ever consider living in a patio home? Feel free to write your questions and comments below. - Price it Right: You should price your home right in any season; however, the fall and winter are especially important. Fewer people are looking for a home in the fall and winter versus the spring. - Make Your Home Move-in Ready: Buyers are less willing to purchase a fixer-upper in the fall and winter because the weather is colder. If your home will require a lot of sweat equity for the buyer, you may want to consider putting your home on the market in the spring instead. If your home only needs a few repairs and updates, go ahead and fix these things. The less work a buyer has to do to the home in the fall and winter, the better. 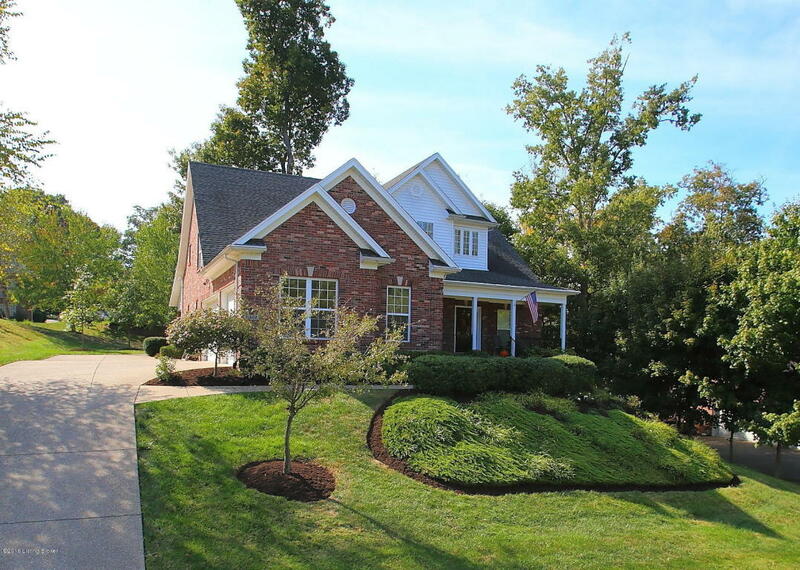 Buyers like move-in ready homes in Louisville. - Make Sure Your Home is Showroom Ready: The first impression a buyer has of your home is the outside. Make sure your lawn is well-manicured on the outside. Pick any weeds in flowerbeds and shrubbery and remove loose branches from trees. On the inside, your home should be clutter free. Buyers want to imagine their belongings in your home. You could rent a storage unit to store some of your belongings until you move to your new home. - Autumn/Winter Curb Appeal: Selling your home during the holidays can actually be a great time because homes can look prettier if decorated for the Holidays. Make sure the décor is tasteful. In the fall, planting seasonal flowers can be a nice touch. If the exterior of your home needs touch-up paint, consider a warmer color for the fall. Also, clearing snow from your sidewalk and driveway can also add to curb appeal. In addition, it makes it safer for buyers viewing your home. - Make Your Home Feel Cozy: Buyers don’t want to walk into a cold home. Set the thermostat at a temperature that will be comfortable for the buyers. Also, open the blinds to let in light, it’ll make the rooms feel larger. 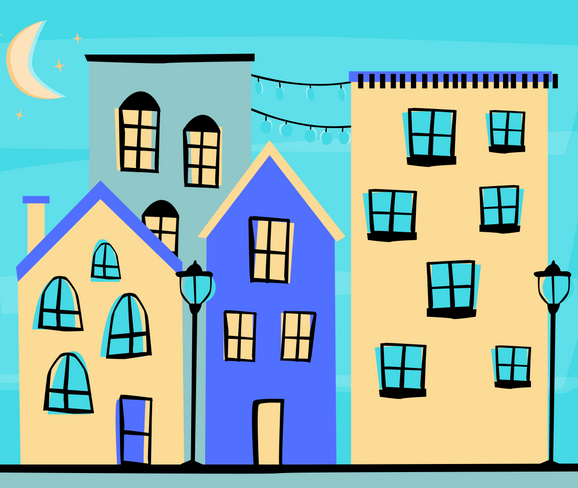 - Allow Daytime Showings: People want to see homes in the daylight. It is hard for the imagination to work properly if you can’t see the backyard. Buyers are serious; if they are tromping through the snow and cold, they are not window shopping. It Won’t Appraise: This is likely the most important reason not to overprice your home. Appraisers are going to look at the same things your REALTOR looks at, comparable properties and condition of your home. A mortgage institution isn’t going to lend money for a home that doesn’t appraise. The mortgage institution will lend money for the price the home appraises for but no more than that. In these cases, either the buyer has to come up with the difference or the seller has to lower the sales price. The buyer has the opportunity to walk away from the transaction at this point too. Lack of Showings: When your home is overpriced, you will likely not have many showings. The buyers’ REALTORs will most likely advise them not to see the home if it is overpriced. Lack of Offers: If you do receive offers, they will likely be low ball offers. 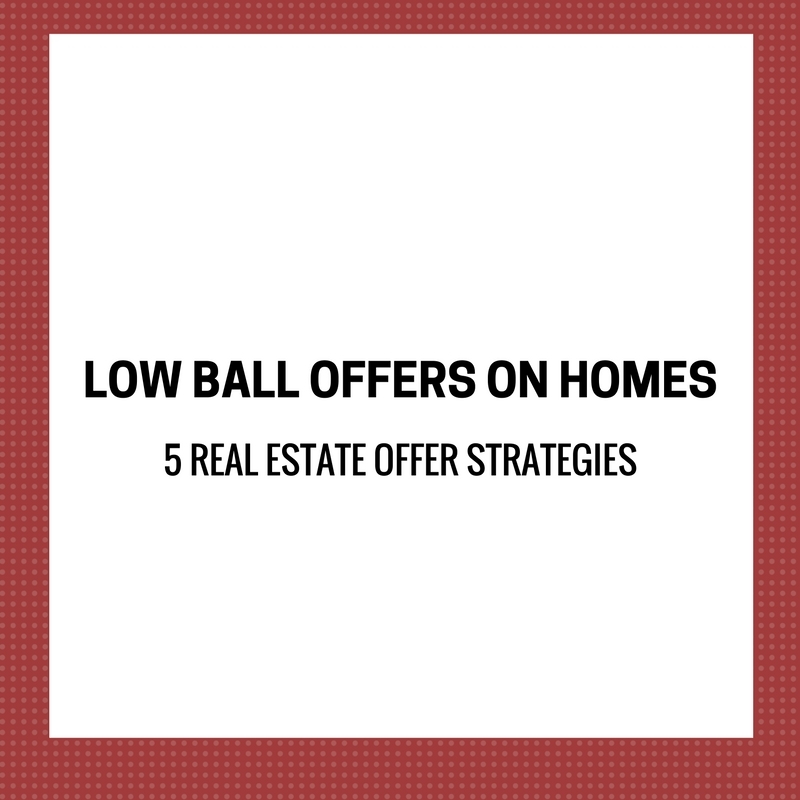 Some buyers won’t even offer you a low-ball offer. Many times, buyers might wait until you price your home right. By that time, the buyer could have already found a home. Becomes ‘Stale’ Home on the Market: Once your home has sat on the market a month or so, people start wondering if something is wrong with your home. It Will Cost You: The longer your home sits on the market, the longer you are paying the mortgage. If you price your home right the first time, it will sell quicker. Pricing your home right doesn’t mean pricing the home below its value. It means pricing the home based on its true worth. Pricing your home right should stimulate interest amongst buyers. In turn, you will see better results. Call Tim Hollinden at 502-429-3866 for more information regarding selling your home in Louisville and surrounding counties. It’s almost that time of year again! Every August, Kentuckians look forward to the Kentucky State Fair. The Kentucky State Fair will take place August 18th-August 28th at the Kentucky Fairgrounds. Admission at the gate for adults, seniors and children are $10. Children under five years old can enter for free. If you want to save a little bit of money on admission, you can purchase your tickets online in advance for $6. You can purchase your tickets on Ticketmaster until midnight on August 16th or at Kroger through August 17th at 10 p.m. Parking will cost $8 per car and $20 for buses. You can also purchase parking in advance for $5 at the Kentucky Exposition Center or at Kroger. For passes on the rollercoasters, you can purchase an all-day pass for $25 for adults and $12 for children. Passes can be purchased in advance for $20 online through August 19th. Gates will open at 7 a.m. and exhibits open at 9 a.m. Most of the rides and tents will close down by midnight Sunday-Thursday and 10 p.m. on Friday and Saturday. Many rides and tents could close down early on Sunday. The following concerts and shows will take place on the main stage this year: Reba McEntire, Jeff Dunham, and Chris Young & Brett Eldredge. Tickets to main stage concerts usually range between $40 to $60 which includes gate admission. There are also a number of free concerts to go to this year, including seven tents that will have bands playing music. It would not be the Kentucky State Fair without the horse shows. There will be several horse shows including 4-H Horse Show, Quarter Horse Show, and Miniature Horse Show. There will also be a livestock show. During the show, some of the exhibitors will be selling their champion livestock. In addition, there will be agriculture products for sale such as tobacco, honey, fruits, vegetables, nuts, etc. There will also be a contest to judge the largest pumpkin and watermelon. There are also many free shows to choose from this year. Some of the types of shows are the fair are magic shows, animal shows, and dance shows. 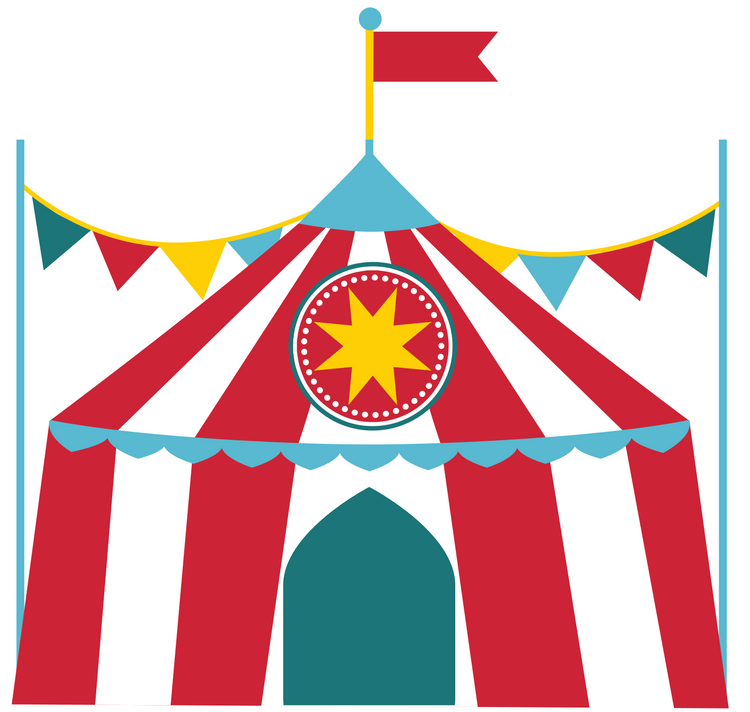 Some of the free shows include Discovery Farm, Paw Patrol Roll Patrol Road Tour, Lady Houdini, Chinese Acrobats of Hebei, and The Magic of David Garrard. Do you have a talent that you would like to showcase? The performing art showcase allows people around the Bluegrass State to present their various talents. Singers, dancers, musicians, comedians, and storytellers are some of the many types of talented individuals that sign up for this show. If you have a product or service you have created and want to demonstrate it to the public, you may want to consider signing up for the product showcase. There are also several cooking contests that you can sign up for as well. You can even register to be a judge! Stay tuned for more Louisville KY Happenings presented by the Hollinden Team. For more information on Louisville and surrounding counties, call us at 502-429-3866.
why should you buy a home in the fall and winter? - Sellers are More Serious: The most popular time to put your home on the market is in the spring and summer. If a seller puts their home on the market in the fall or winter, it usually is because they are serious about selling their home. If a seller is serious, sometimes negotiation is easier. - Competition Amongst Buyers is Lower: More buyers purchase a home in the spring and summer versus the fall and winter. Many buyers that have children like to move into a new home before their children go back to school. You may have an easier time getting the home you want in the fall and winter. In addition, you should have the opportunity to go back to view the property several times before making a decision. This past summer, the competition was so high that buyers were having to make a decision immediately after seeing the home. 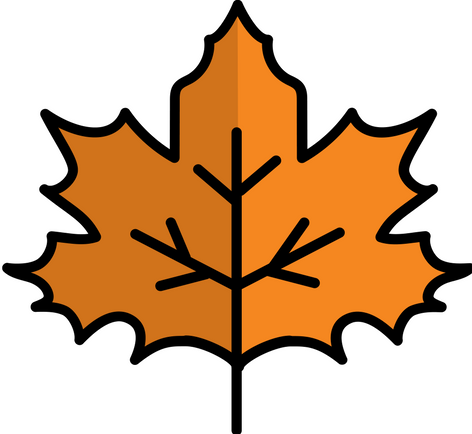 Do you have questions about buying a home in the fall and winter? Leave your comments below. 1.) Access to all Properties Listed- Did you know that not every home for sale is advertised on large national websites like Zillow? 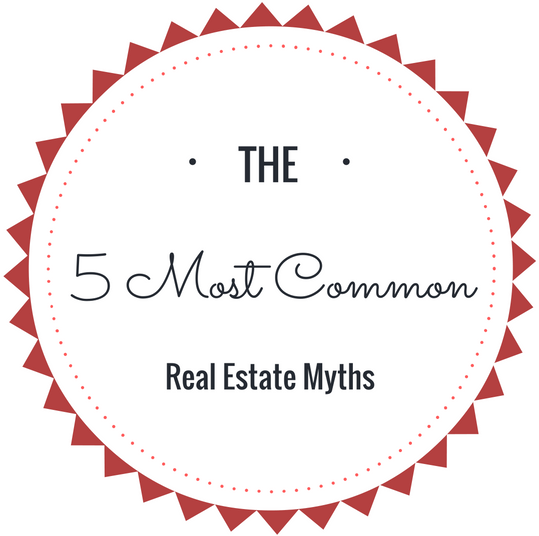 REALTORs pay yearly fees to have access to the MLS. The MLS will show every home for sale in the local market and surrounding areas. Without a REALTOR, you could miss out on several homes for sale. 2.) 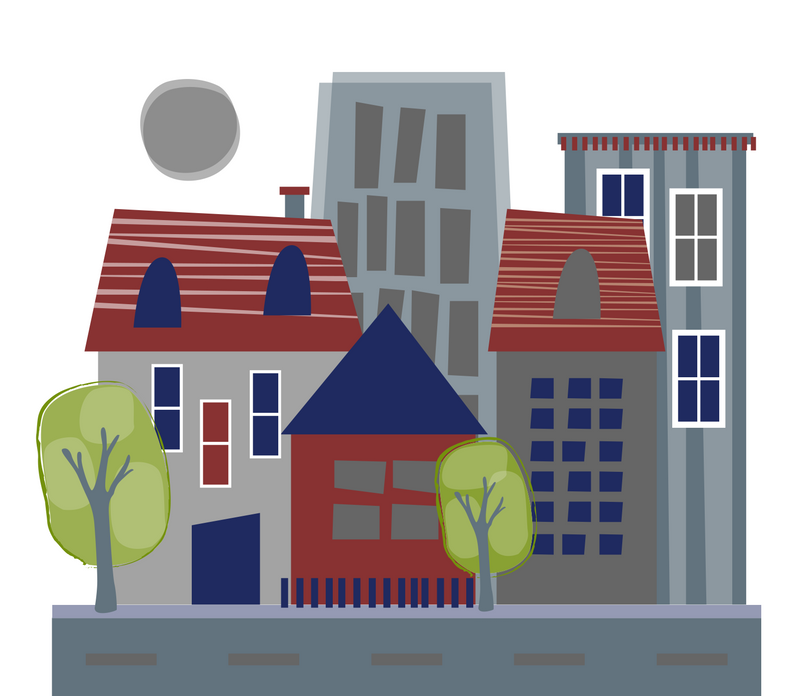 Knowledge of Neighborhoods and Schools- REALTORs are your local neighborhood experts. Your REALTOR can help provide information regarding appreciation rates, schools, crime rates, and so much more. 3.) Up-to-date Information on Real Estate Laws and Regulations- REALTORs are required to attend continued education classes. These classes cover the latest trends and regulations that help REALTORs serve their clients better. 4.) Price Guidance- Homes are overpriced more often than you would think. Do you really want to pay more for a home than what is worth? Often, buyers will determine a home’s worth based on inaccurate home value tools on the Internet. A REALTOR will have access to comparable properties that have sold in the area to determine the best price to offer. 5.) Negotiation- When you work with a REALTOR, many of the emotional aspects are taken out of the negotiation. In relation to price guidance, if you really love a home that is overpriced, you may be forced to put in a lowball offer. REALTORs have been in this situation before and can present the offer in a diplomatic fashion. Also, there may be additional items in the home that you want to request to remain with the property. Your REALTOR will be able to determine which items would be appropriate to request to stay with the property. 6.) Strategy- Some sellers are harder to negotiate with than others. This is when you need a great real estate agent with excellent sales strategy. Every seasoned real estate agent has sales strategies to ensure you get the best deal on your home. 7.) Paperwork- There are loads of paperwork involved in a real estate transaction. A Greater Louisville real estate sales contract alone is seven pages! You’ll also be required to sign numerous documents in addition to the sales contract. These documents are filled with legal terminology and information that are best understood by a seasoned REALTOR. 8.) Hiring a Buyer’s Agent is Free- The listing agent and buyer’s agent split the commission that the seller pays. You not are required to pay your REALTOR to represent you when you are buying a home. Do you have any further questions about purchasing your first home? Leave your comments below. - Driveways: Is the driveway steep? This could make maneuvering in the ice and snow especially difficult. 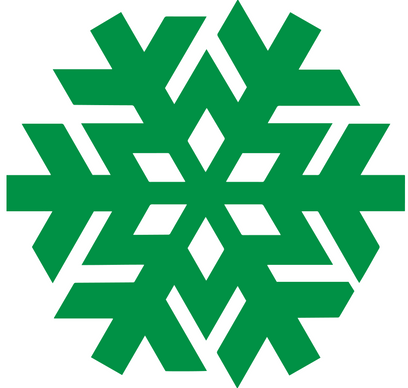 - HOA: Does your association fees cover snow removal? If not, are the streets city owned? City owned streets should be snow plowed. If the neighborhood has no HOA and the streets are not city owned, driving through the neighborhood could be difficult when it snows. - Water Drainage: Ideally, you want water to drain away from your house. We don’t have as much evaporation in the winter. - Windows: How old are the windows? Old windows are less energy efficient. It is important to have windows that are in good condition and newer in the winter. - Air Conditioner: Although you won’t be using the air conditioning in the winter, you want to make sure that it is going to work for the following summer. This is something that buyers often forget about when buying a home in the winter. Being a well-prepared buyer and/or seller makes the home buying or selling process a smoother transaction. As a seller, following these tips should help you find success in selling your home quicker. As a buyer, these tips should help you avoid costly repairs and inconvenience when purchasing a home. For more information regarding buying a home or selling your home in the fall and winter, call The Hollinden Team at 502-429-3866. 9823 White Blossom Blvd. is now under contract. Stay tuned for future opportunities or call The Hollinden Team at 502-429-3866 for more information homes in Springhurst. Welcome to 9823 White Blossom Blvd! This stately five bedrooms and two-and-a-half-bathroom Springhurst home is ready for new owners to call home. Approaching the home, you will see that the home has great curb appeal. The landscaping is well manicured and the outside of the home is polished looking. Inside the home, there is an attractive foyer with a lovely staircase with iron spindles. There are Brazilian cherry hardwood floors throughout most of the home. 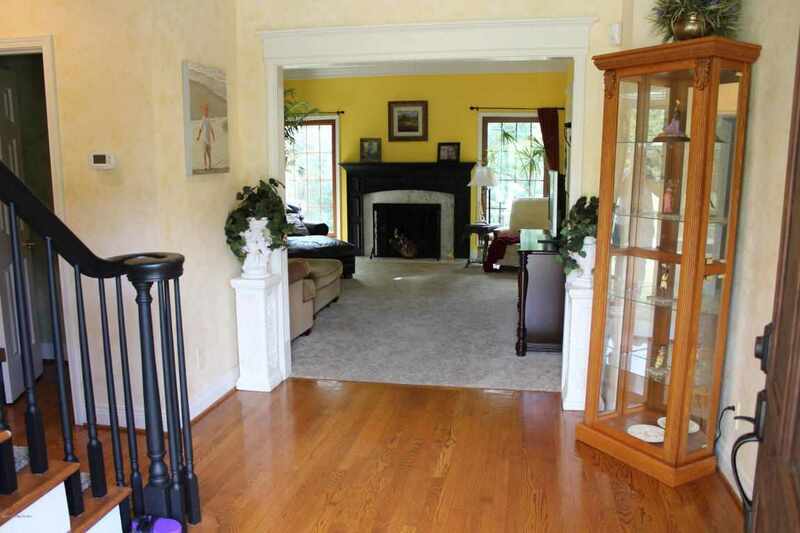 Moving to the right of the foyer, you will find the formal living room. The formal living room has nice windows that let in a lot of natural light. The formal living room flows into the dining room. To the left of the foyer, there is a home office. Like the formal living room, the home office offers great natural light. The office is very well-appointed as it is away from other rooms in the home, allowing for a quiet place for someone to work. Moving to the dining room, you are offered plenty of space for a large dining room table. The dining room features a trendy woven light fixture that would go with just about any color scheme. The dining room offers access to the eat-in kitchen. The kitchen is tastefully remodeled with modern day upgrades. 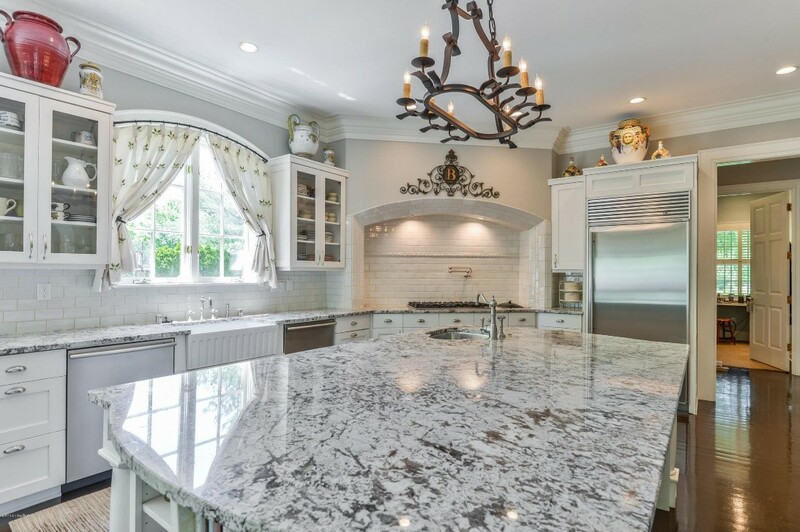 Some of the features in the kitchen are granite countertops, stone and glass backsplash, stainless steel appliances, center island, and pantry. Next to the eating area in the kitchen are doors to access the patio. Connected to the eat-in kitchen is the family room. The kitchen and family room are separated by beautiful columns. 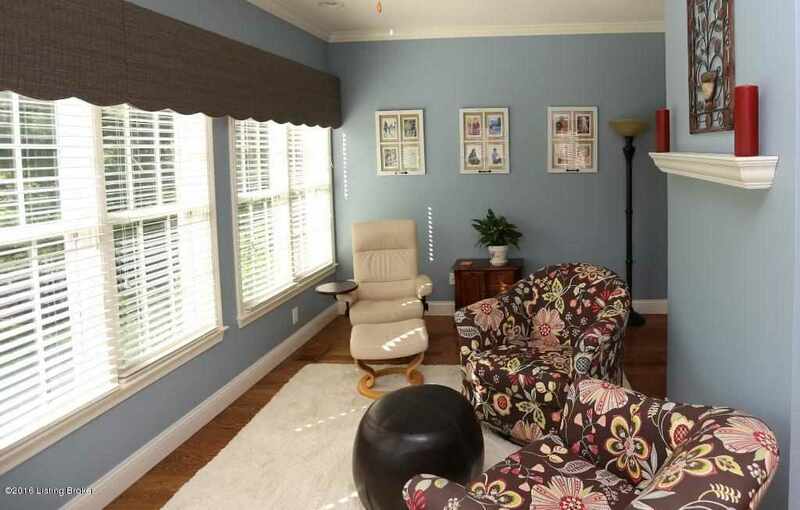 The family room features built-in bookcases, fireplace with mantle, and updated ceiling fan. There is a laundry room and half bathroom on the first floor as well. The laundry room has a folding table and cubbies for storage. The half bathroom has an updated vanity and light fixtures. On the second floor, there are five bedrooms and two bathrooms. Each bedroom has the same lovely Brazilian cherry wood flooring as the downstairs. The bathrooms are truly a must-see in this home. Each bathroom features dual contemporary vessel sinks, updated vanities, and ceramic tile HEATED floors. The owner’s bathroom also has a large soaker tub and separate frameless glass door ceramic tile shower. 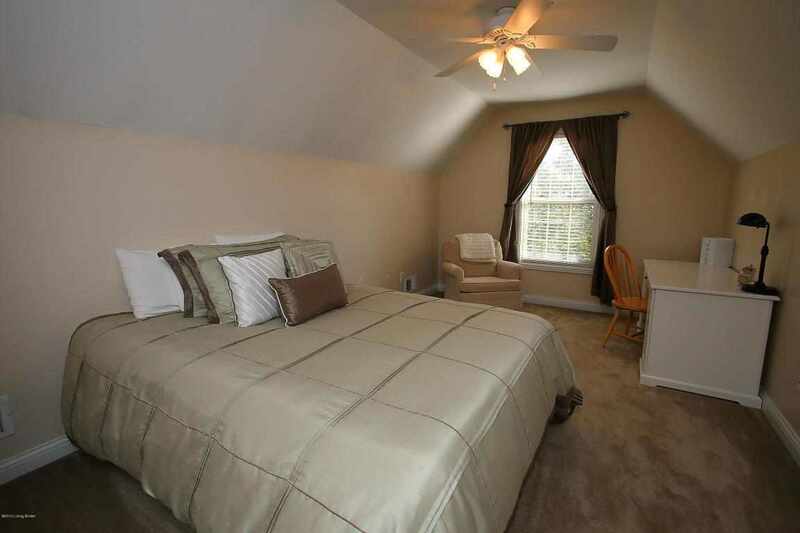 The owner’s bedroom boasts vaulted ceilings and double door entry. The walk-in closet has many racks and shelves for all your clothing and shoes. The lower level has a nice sized family room, perfect for movie night. The walls are painted a neutral beige color, allowing you to personalize as you please. There is also a room used as a playroom now in the basement. This room could be used for many things such as an office, bedroom, home gym, or game room. The last area in the basement is an unfinished area that could be used for storage. The basement is roughed for a full bathroom. Also, a radon mitigation system has been installed. In the back of the home, there is a large fenced in backyard. The patio is covered and has ceiling fans to keep you cool on hot days. There is also a nice playset in the yard that will remain with the property. 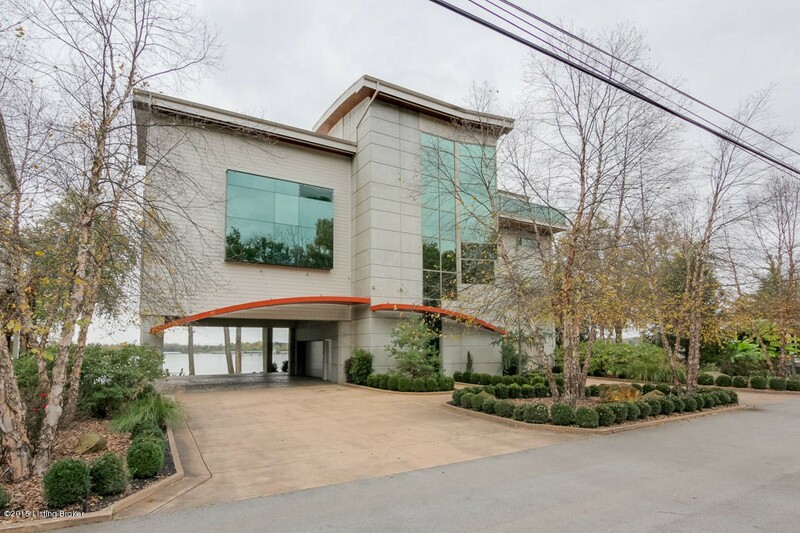 For a private tour of this gorgeous home located at 9823 White Blossom Blvd. 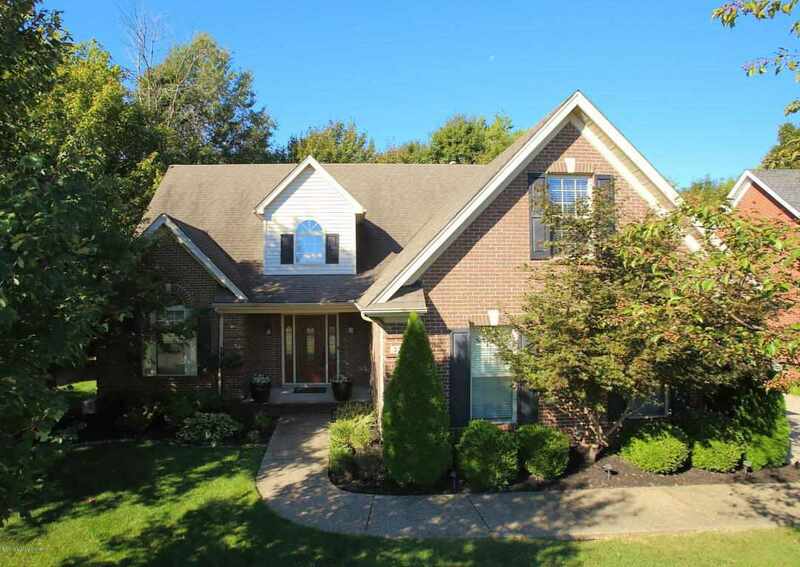 located in Springhurst, known as Louisville MLS 1453021, give Tim Hollinden a call at 502-429-3866. If you want to see other homes for sale in Springhurst, The Hollinden Team can help you with that as well.